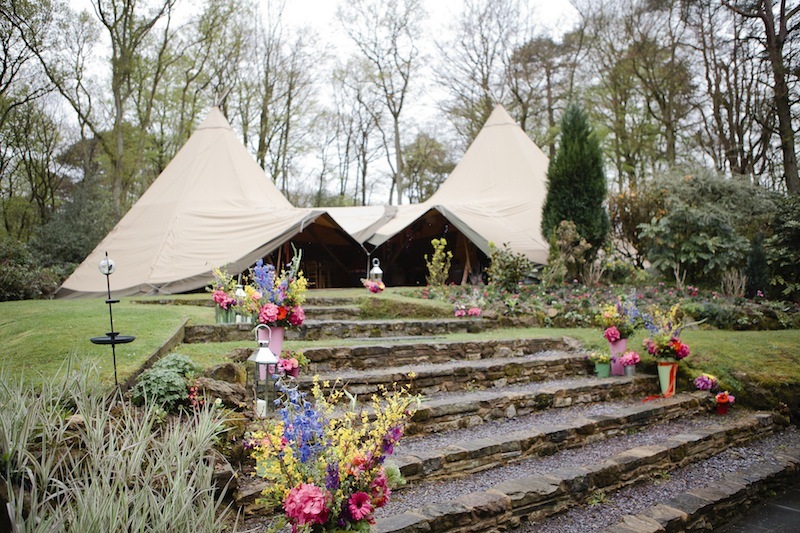 Then Sunday was the day where our gorgeous couple really got their wish to be married at their stunning home. 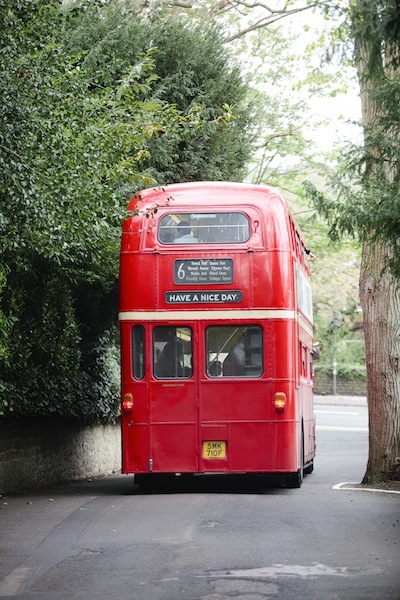 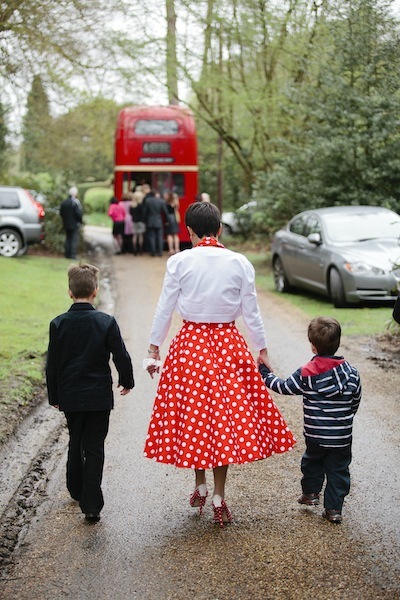 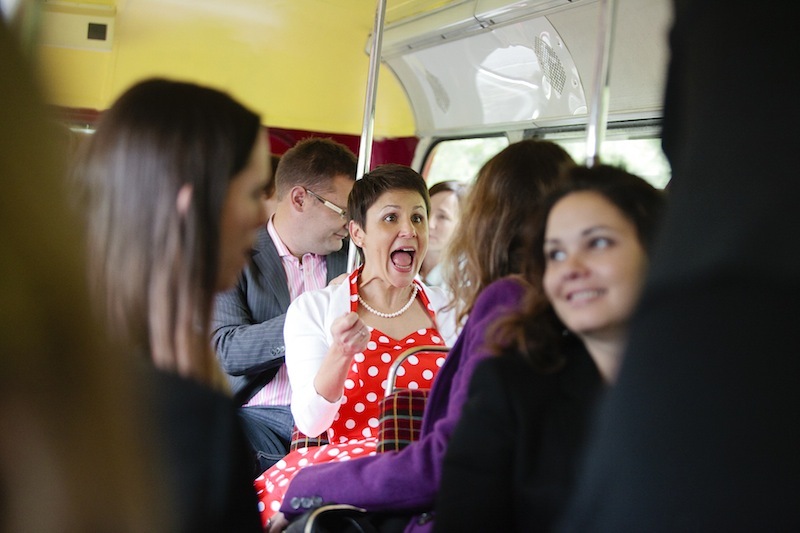 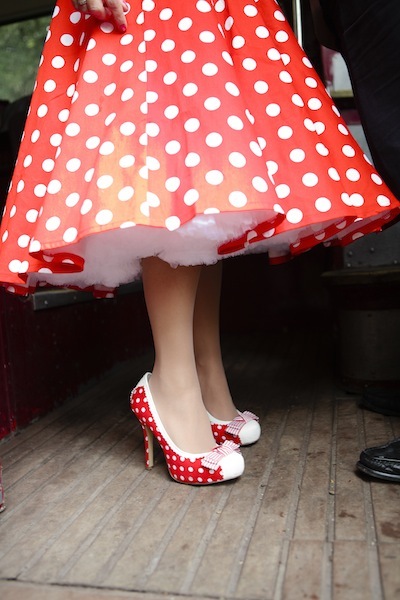 The morning began when Lucy Baker arrived with her team of wonderful make up artists and gave the bride and her party a beautiful vintage looking make over to match Kate’s wonderfully 50s styled dress again from Vivien of Holloway. 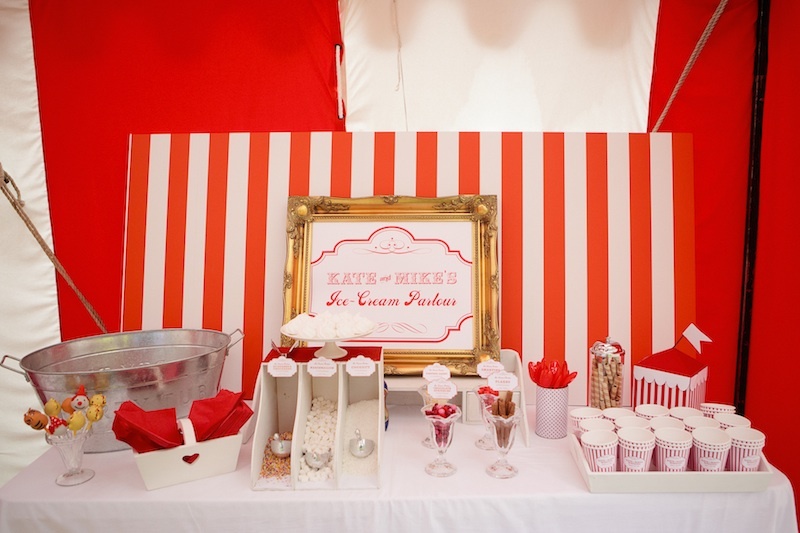 Mike and Kate wanted to separate the wedding into 3 areas. 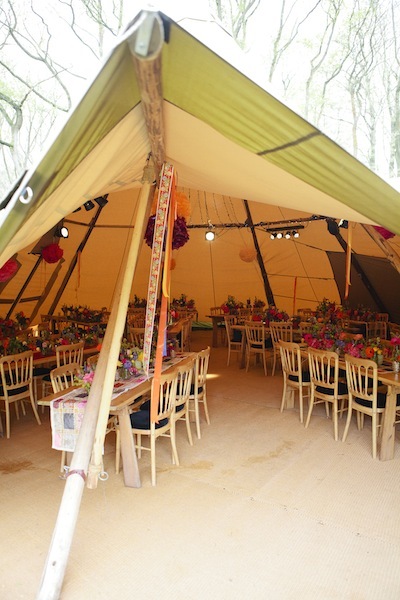 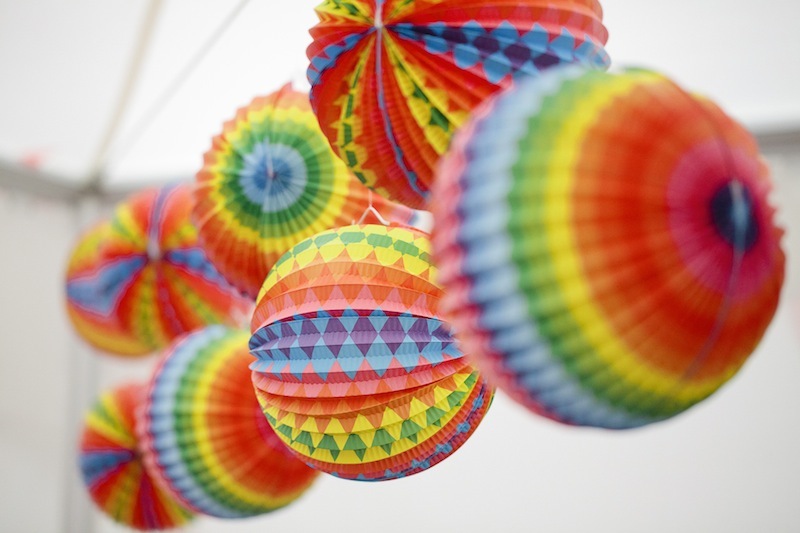 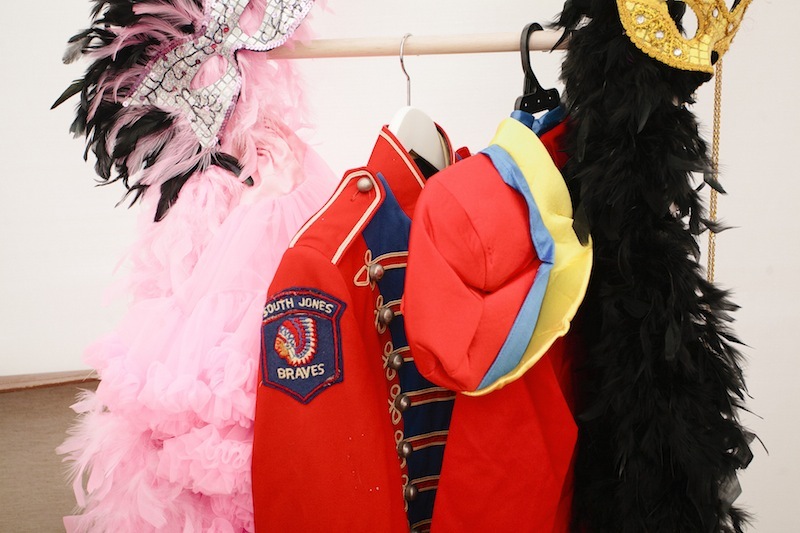 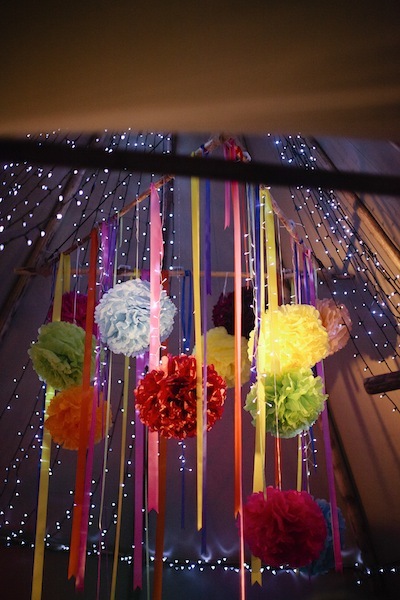 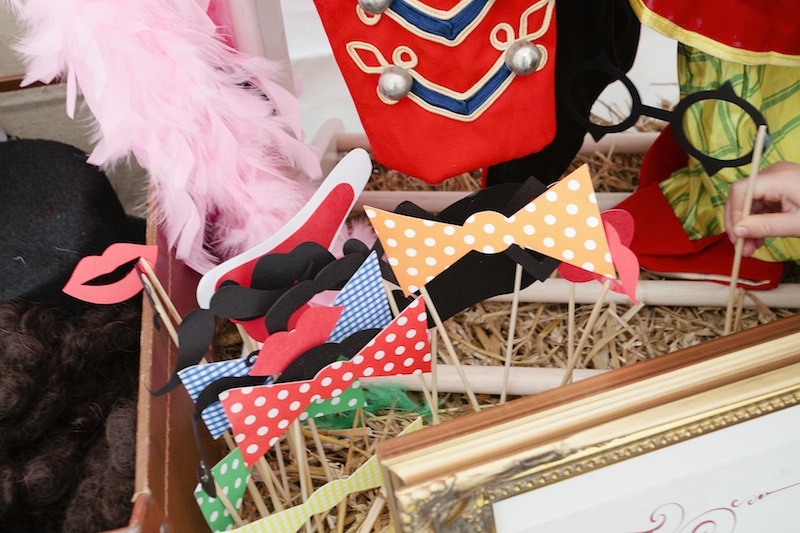 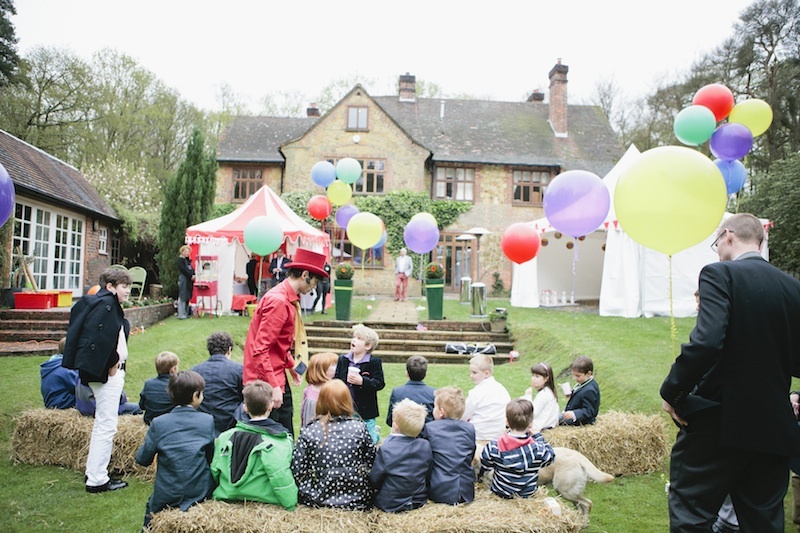 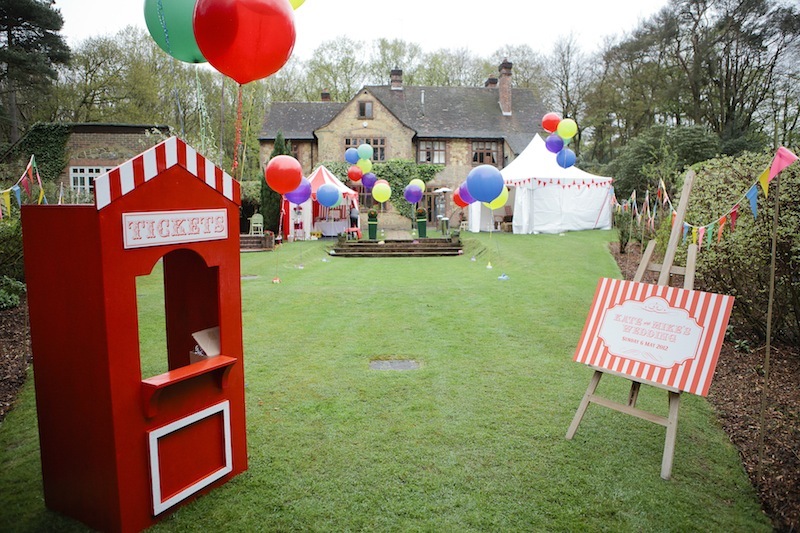 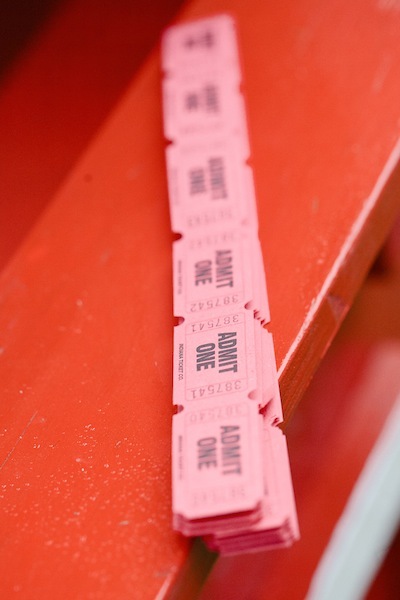 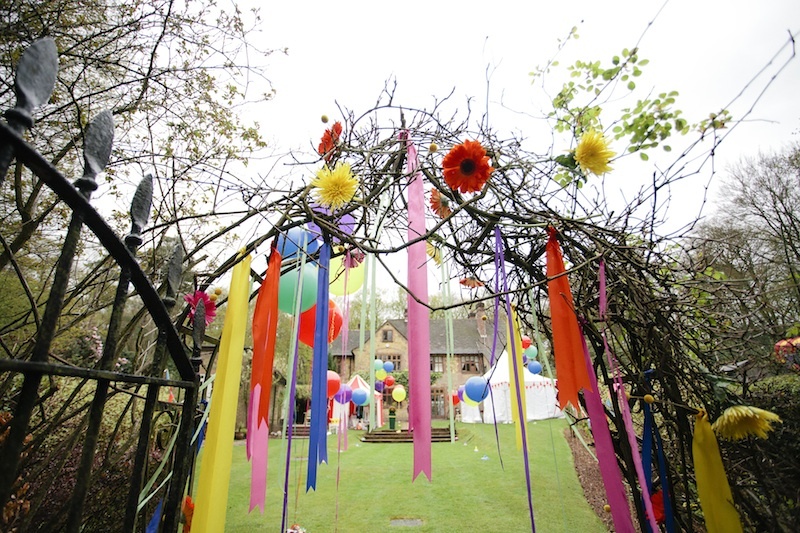 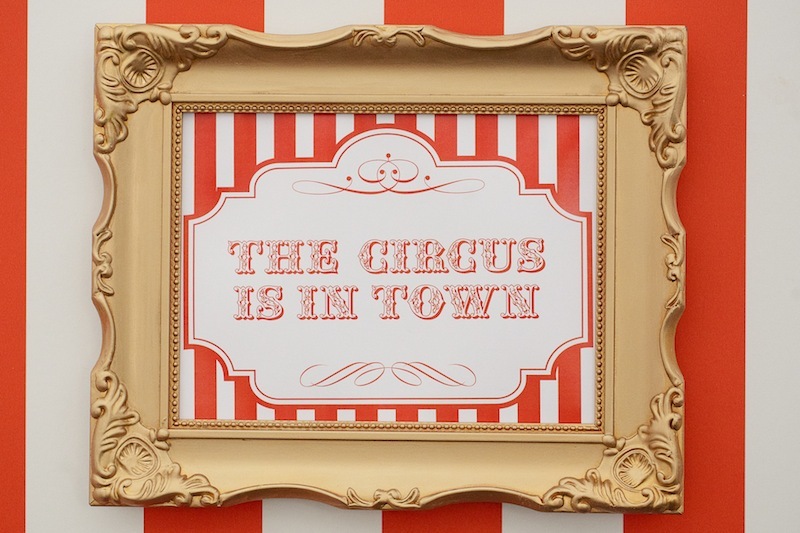 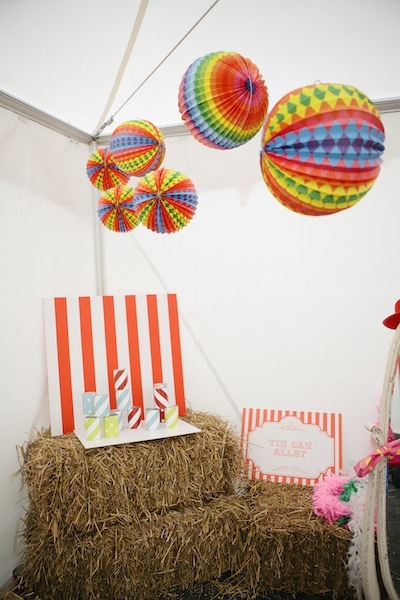 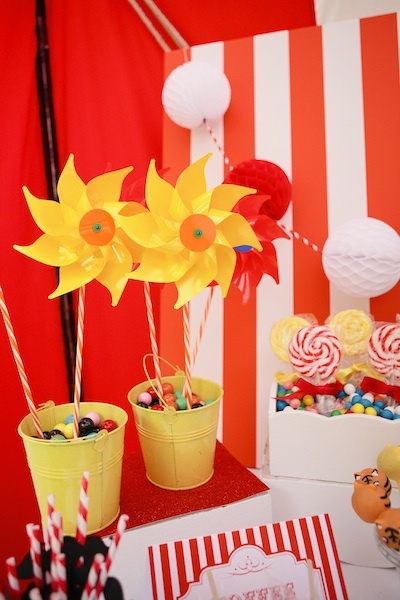 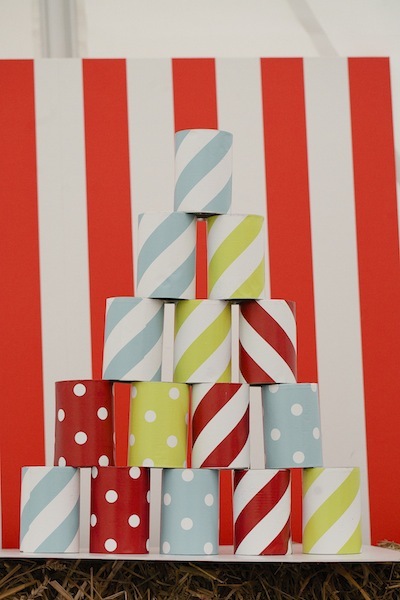 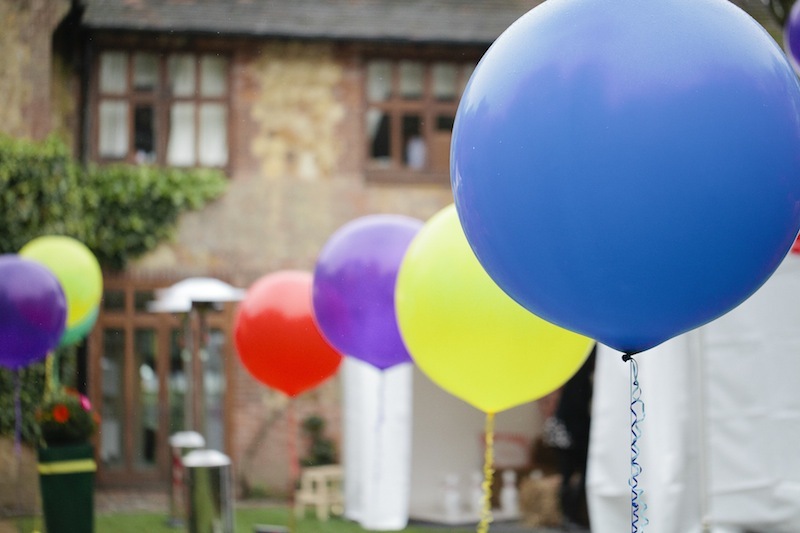 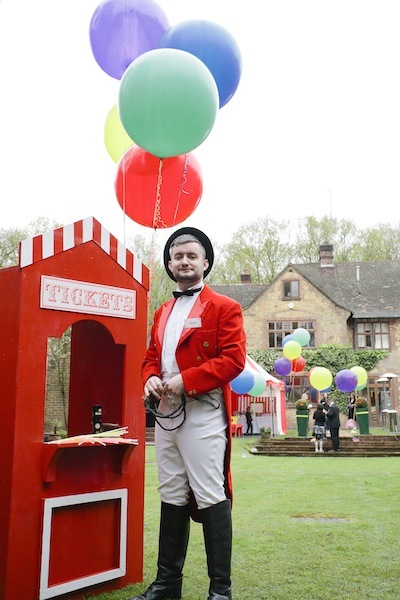 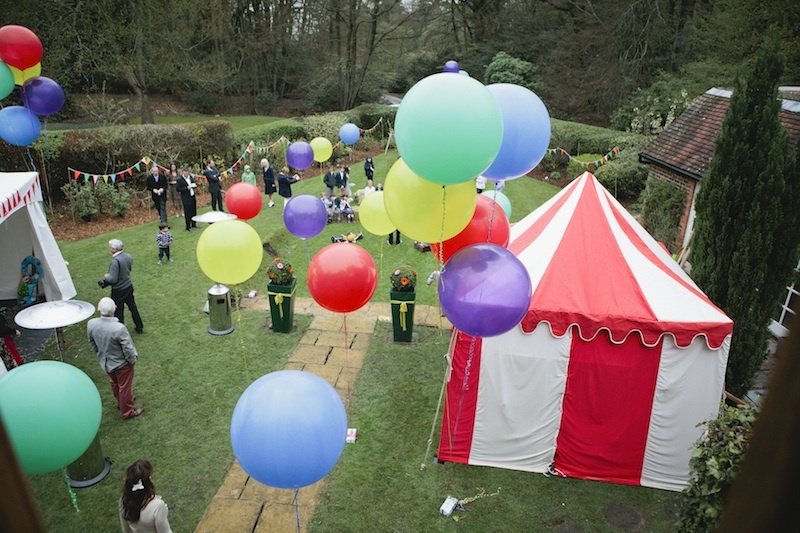 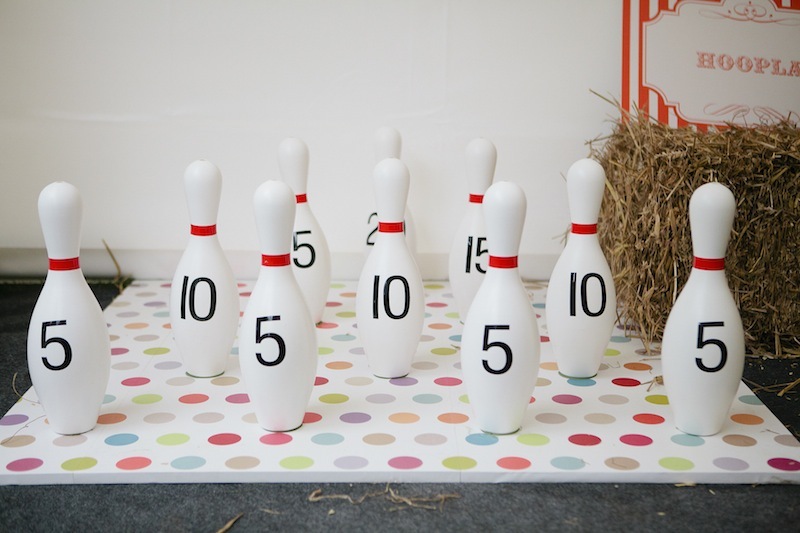 An area for the children to have a circus themed party where they could dress up, play games, eat some scrummy food and to be entertained by the finest circus performers. 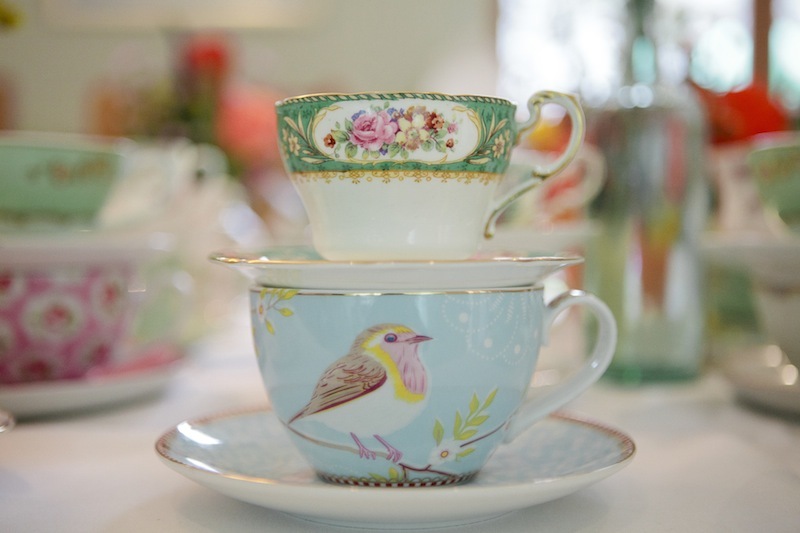 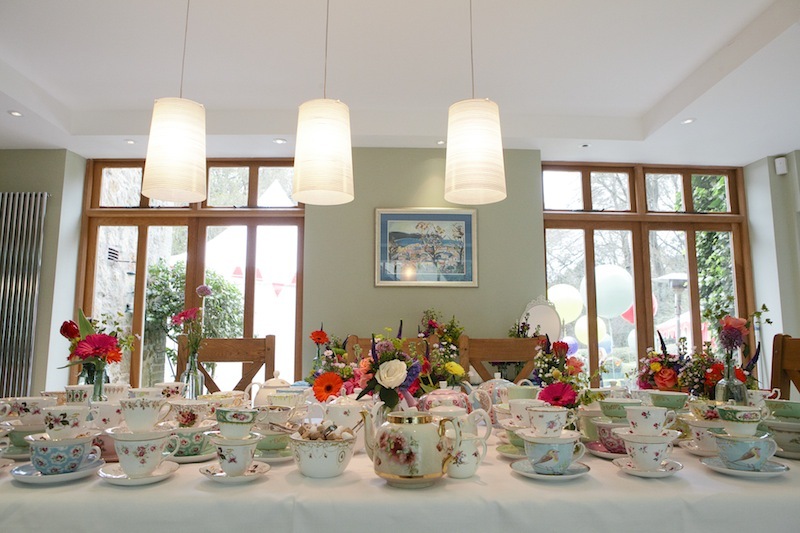 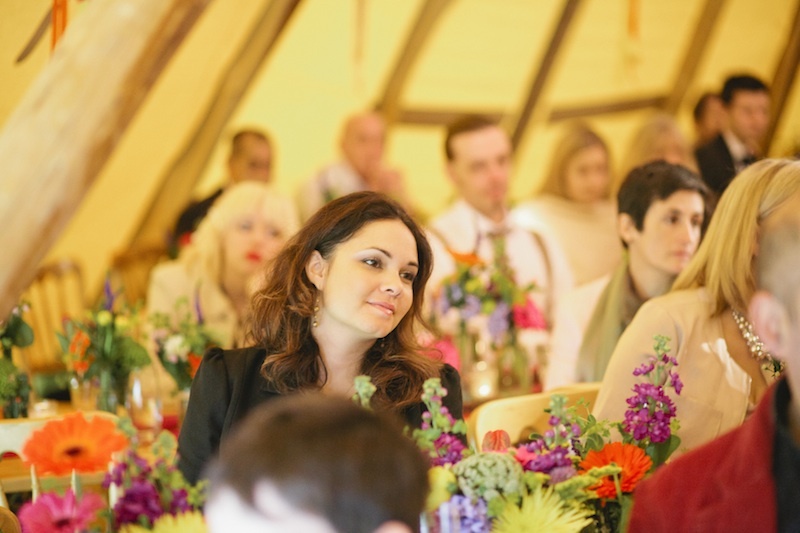 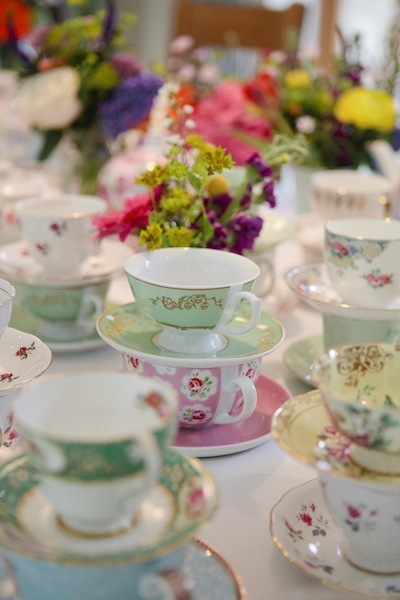 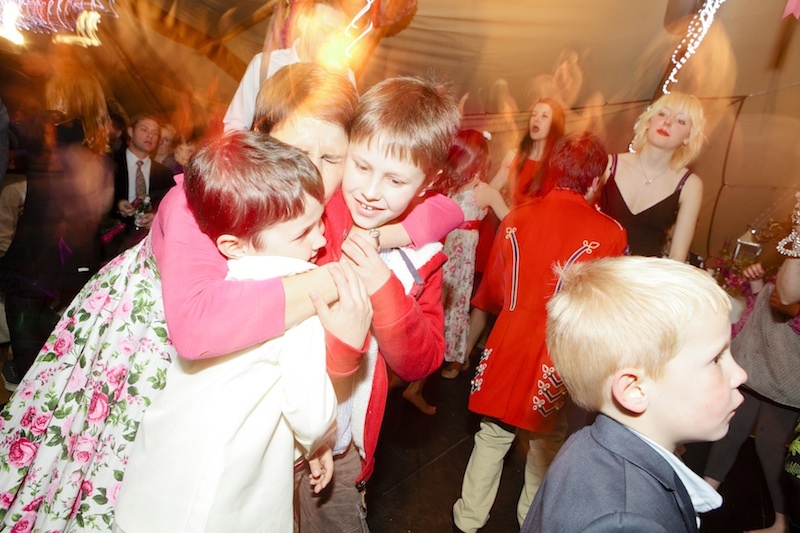 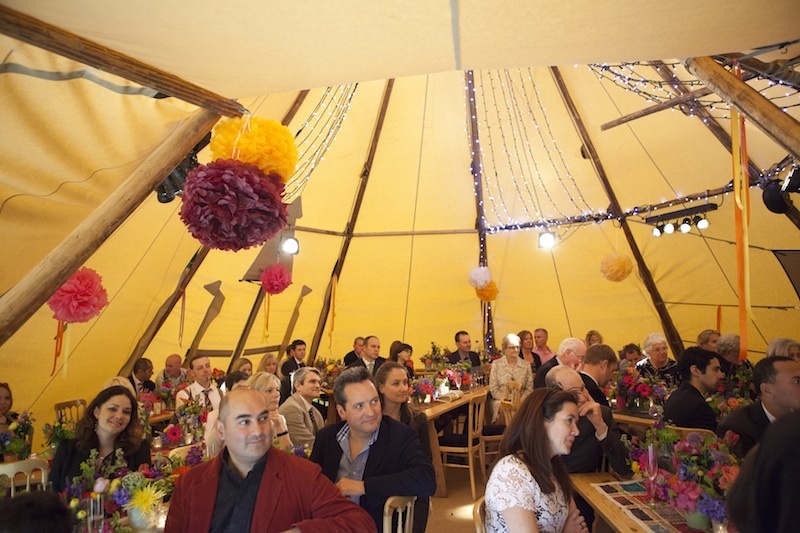 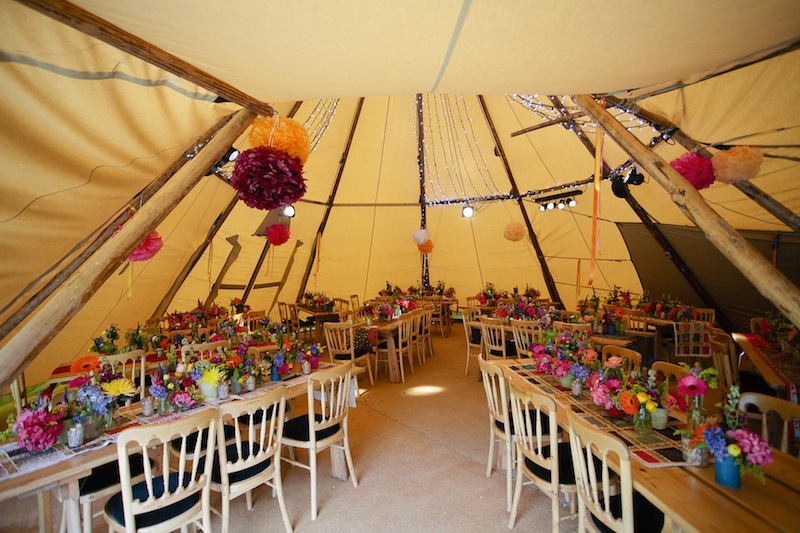 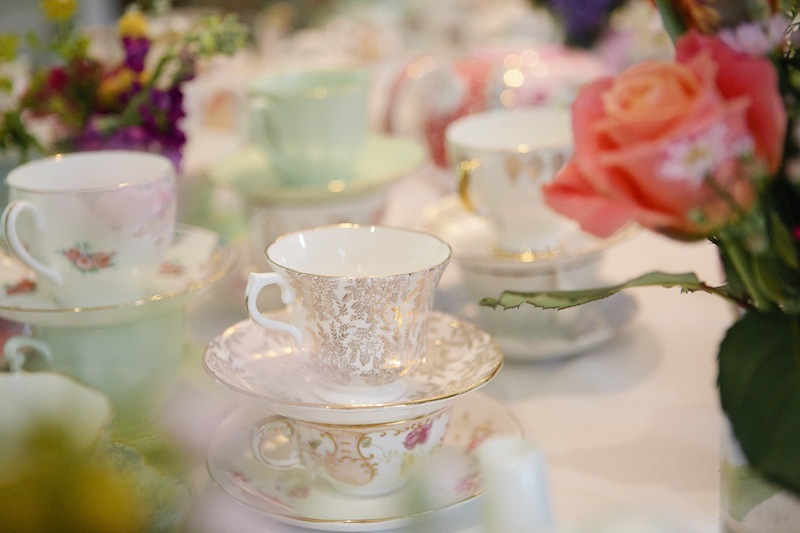 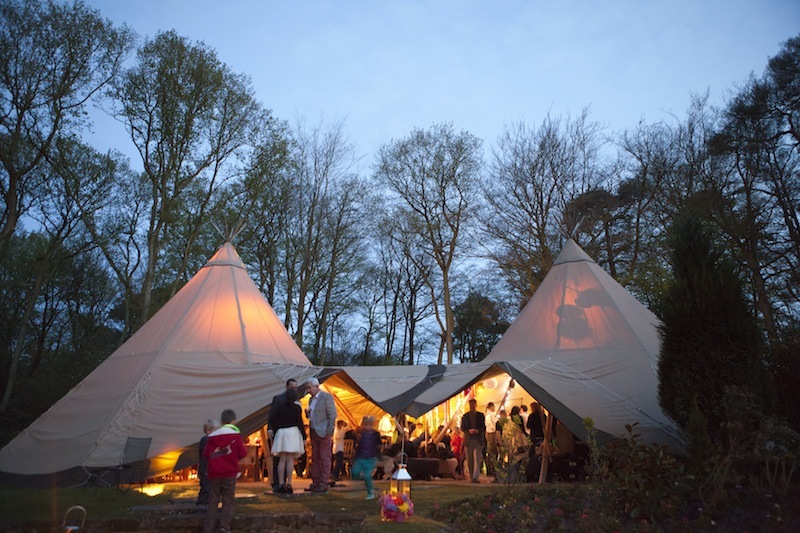 They also wanted a place inside the house for the adults to enjoy a vintage tea, cake, cheese and strawberries and then the main ceremony and party to take place in the garden under The Stunning Tents . 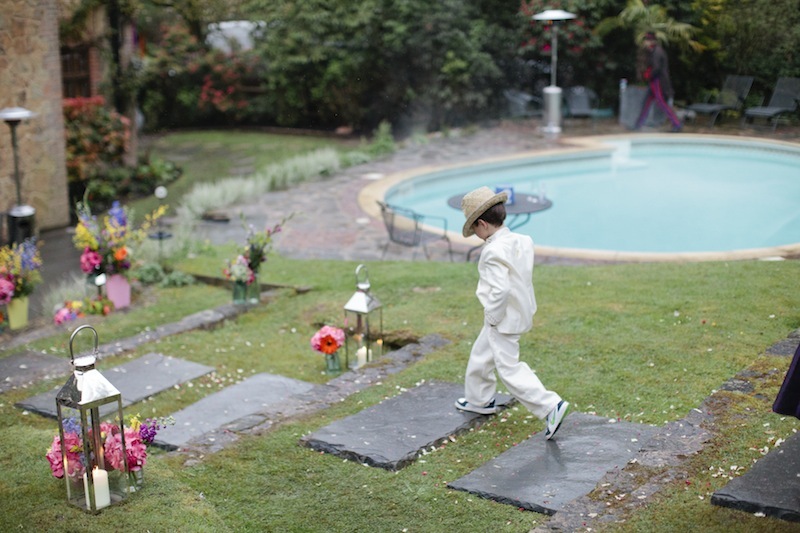 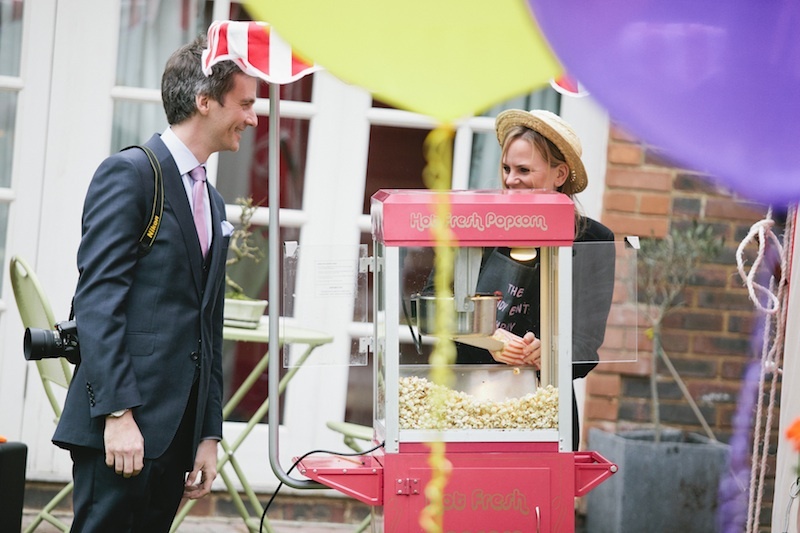 Their wish became a reality when Purely Events added their special magical wedding sparkle and created a visually gorgeous setting in all three areas. 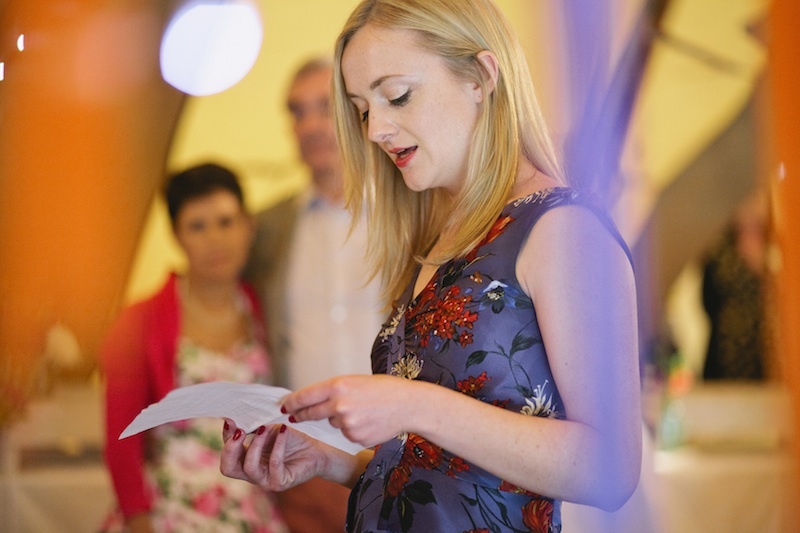 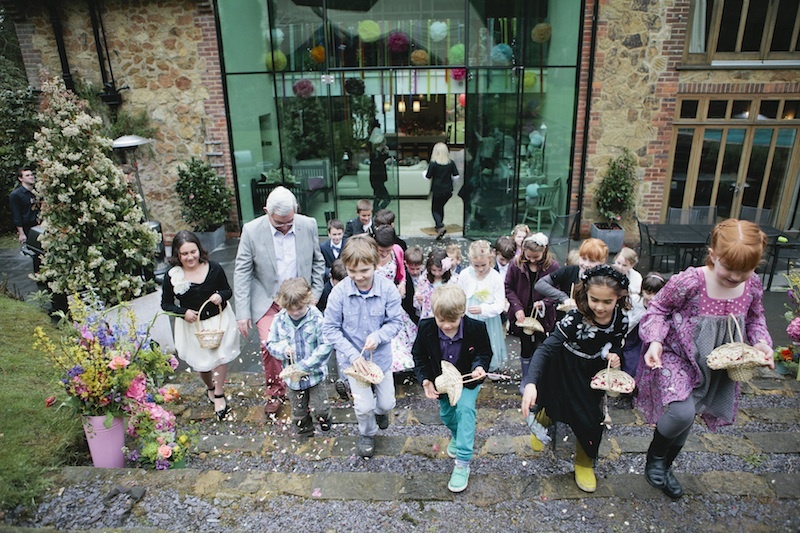 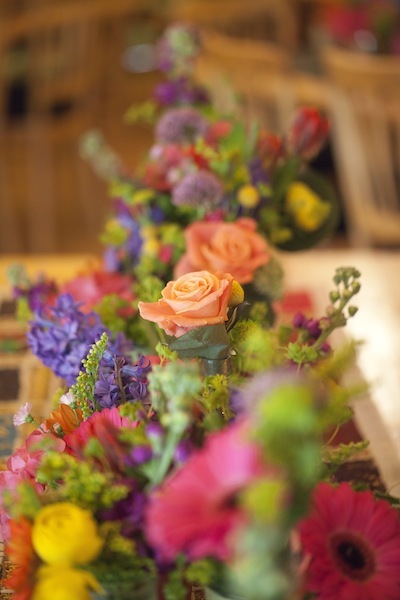 Purely Events knew that Lilys Flowers were the perfect florist for this wedding. 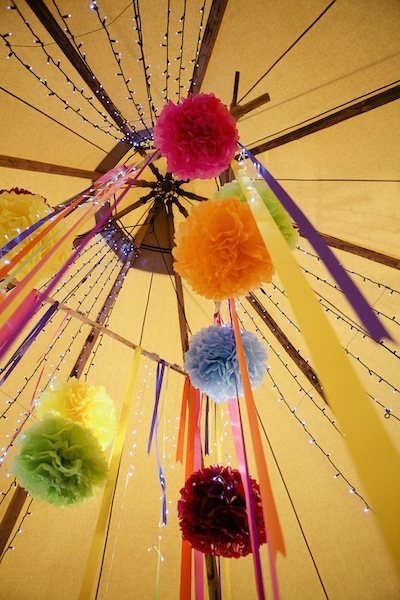 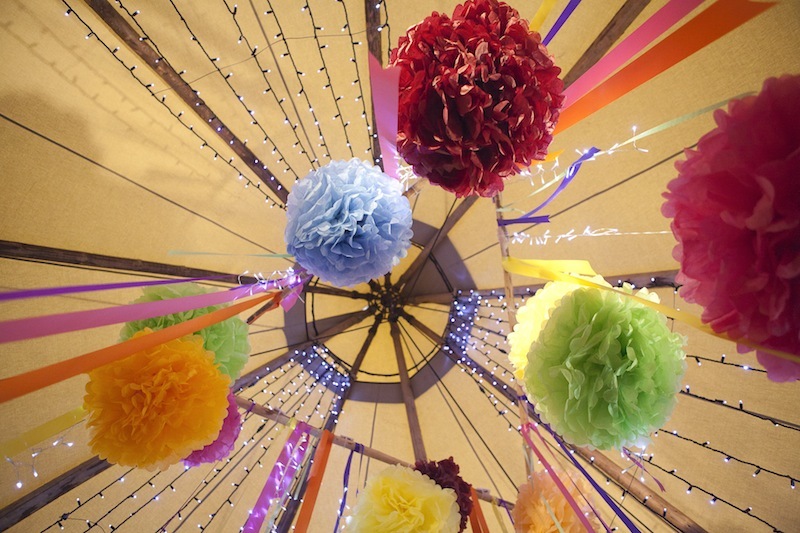 We all worked together to decide how the flowers should look and as can be seen in the photos the girls at Lily’s surpassed themselves with their wonderful delicate displays mixing lights, pom poms and very bright vintaged styled flowers. 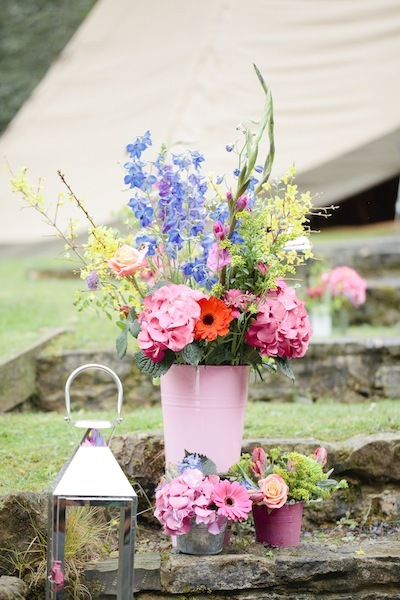 It completely brightened up the house and gardens making it all look simply stunning. 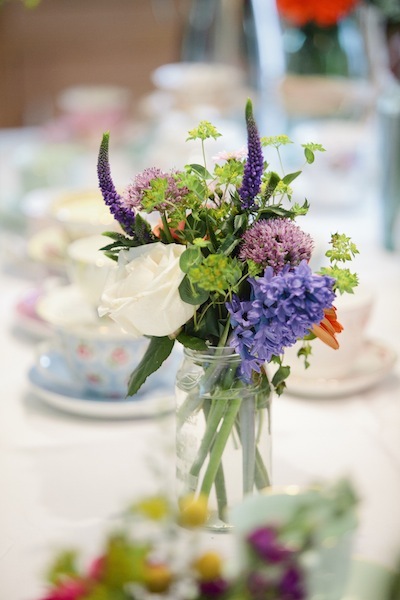 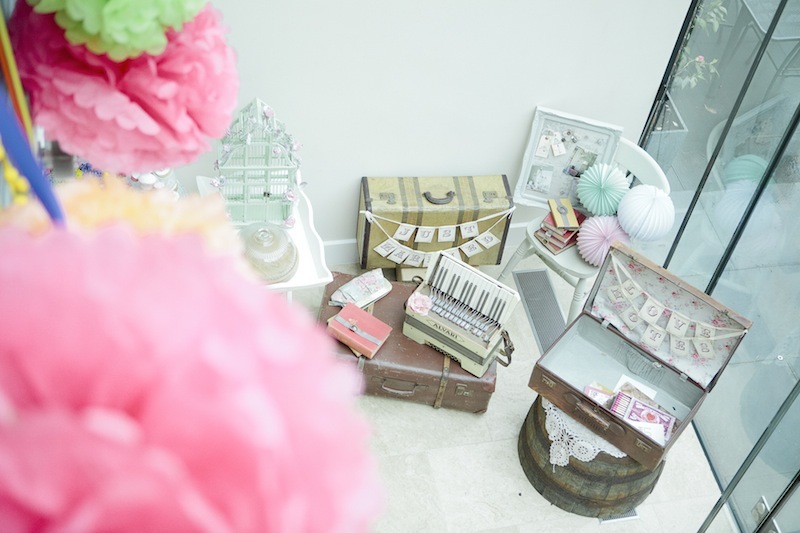 The glass bottles the flowers sat in were sourced by Purely Events, as well as the vintage crockery and props. 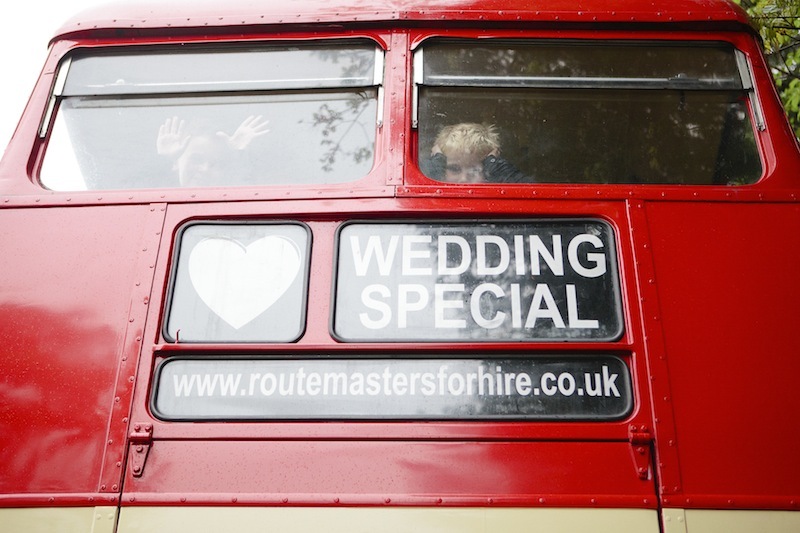 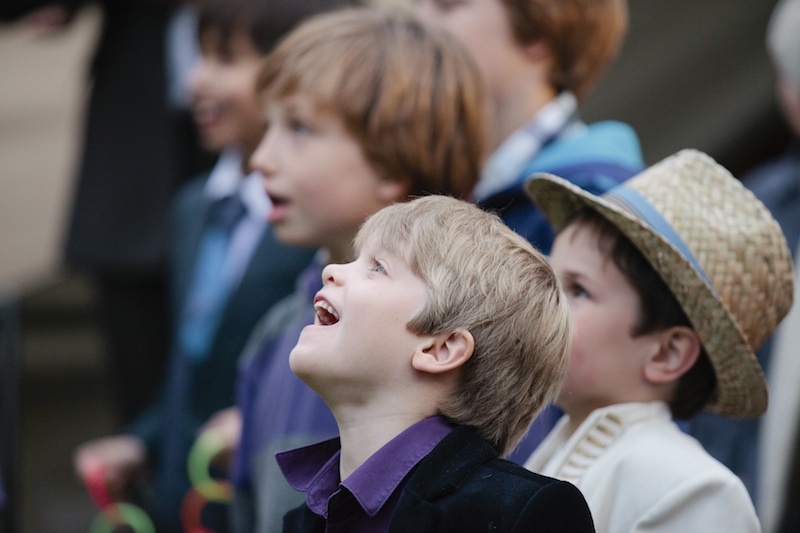 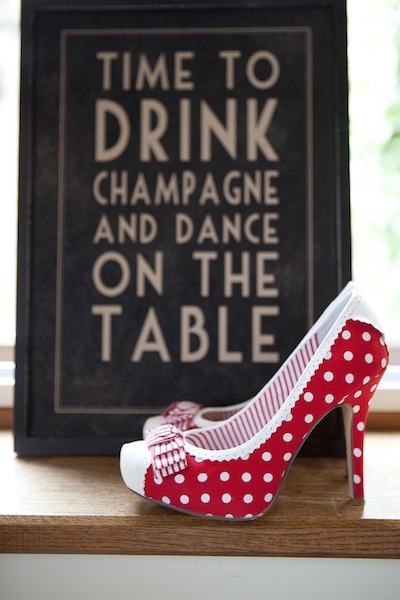 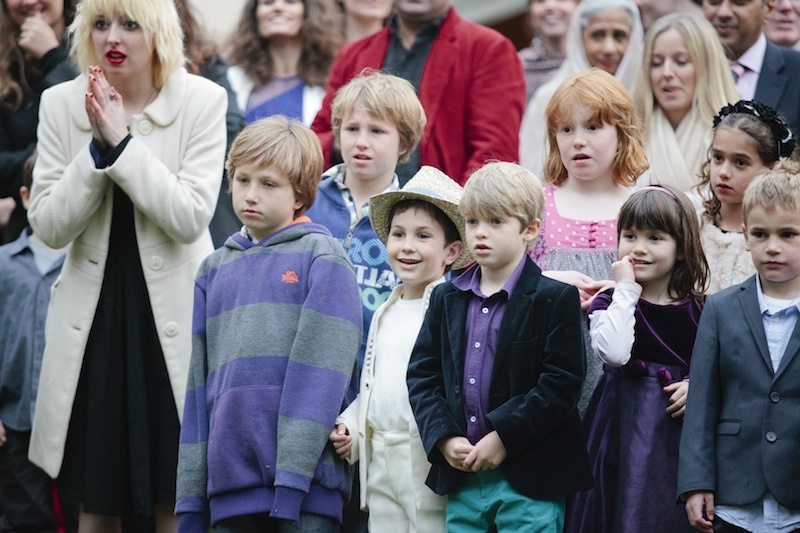 We will happily loan them to any bride and groom thinking they would like to hire them for their own wedding. 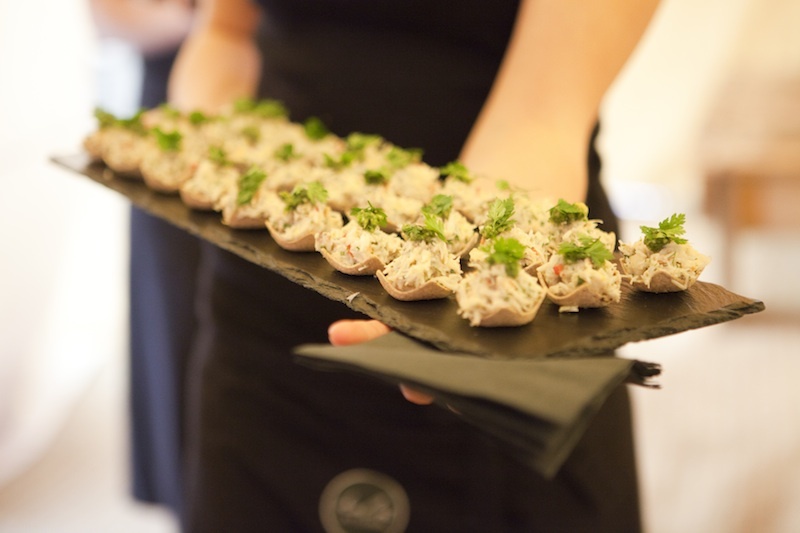 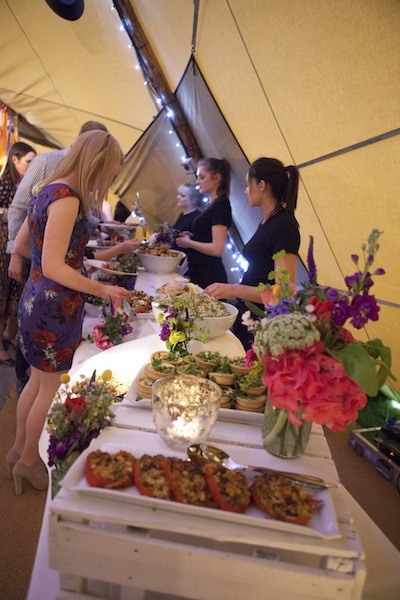 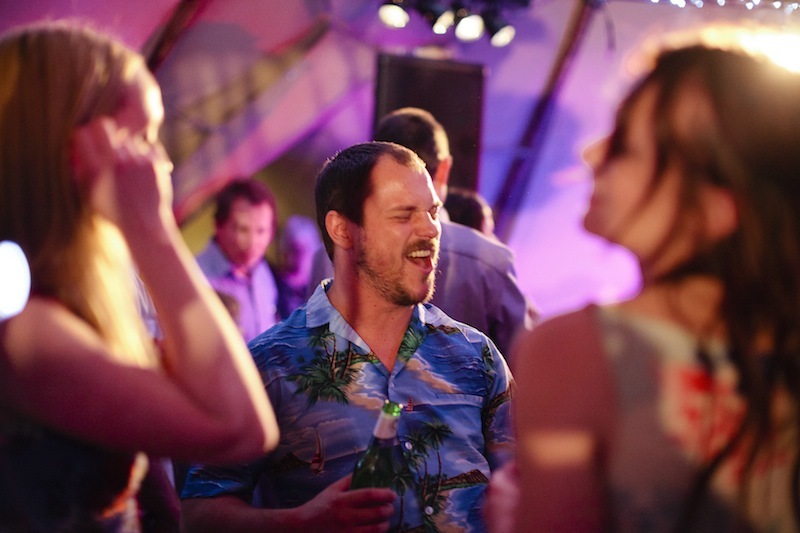 The food and drinks service was all provided by Kalm Kitchen one of Surrey’s most equisite catering companies run by the most delicious people James and Jen. 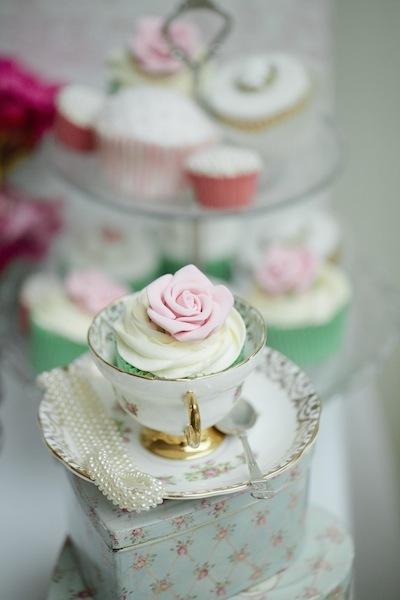 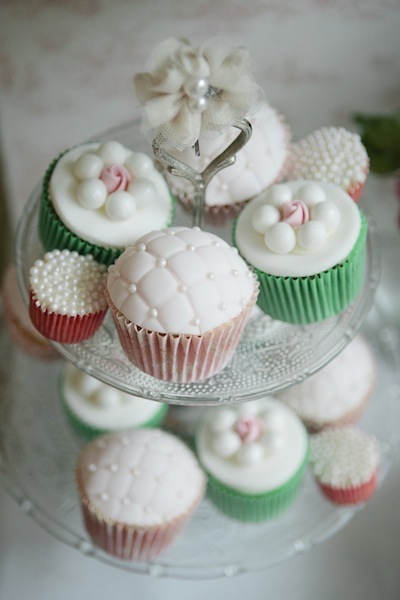 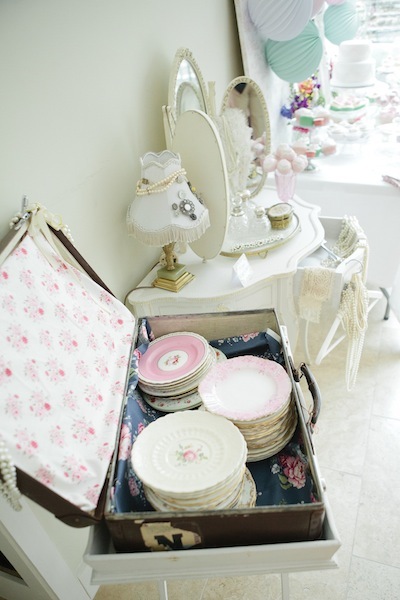 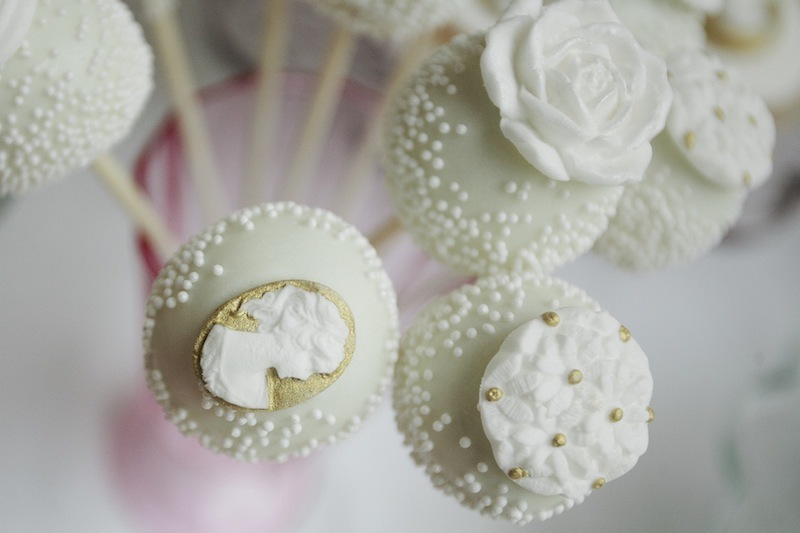 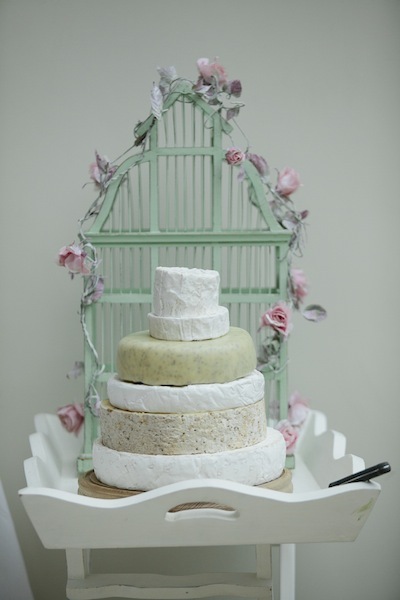 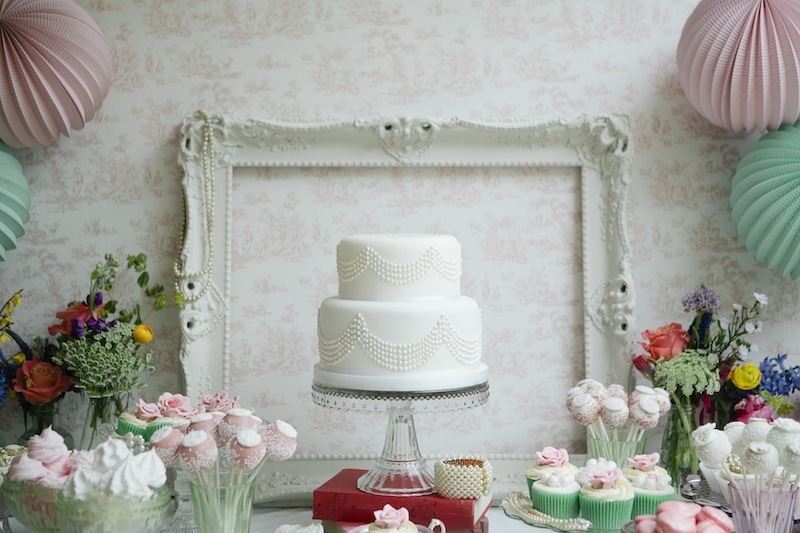 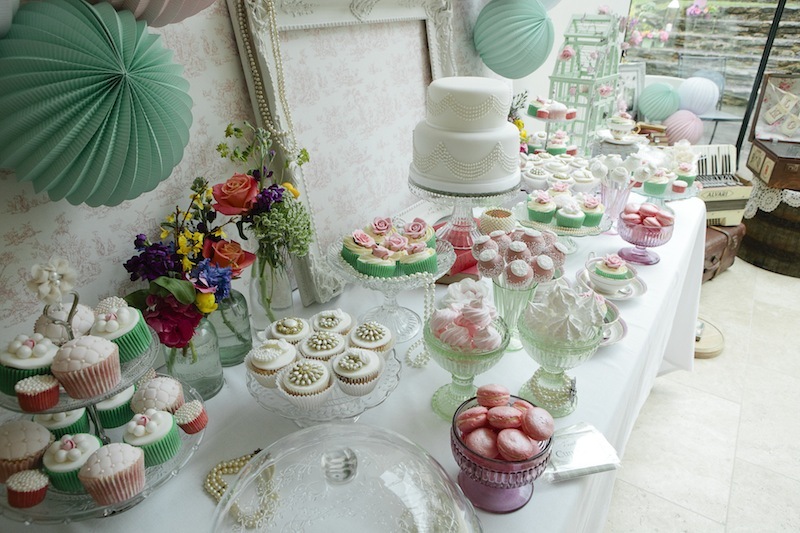 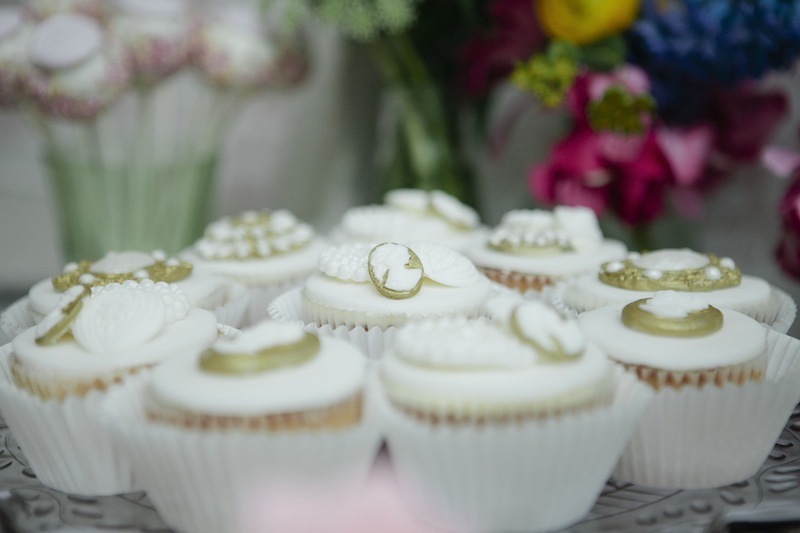 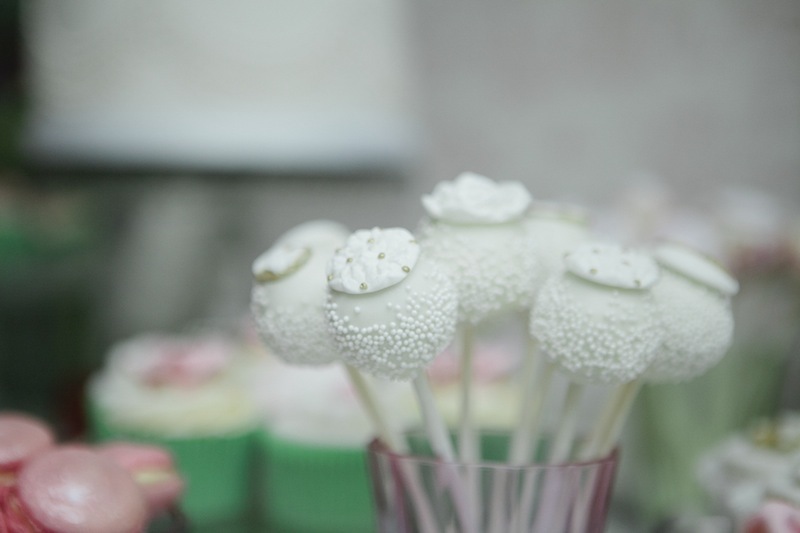 The cake table was styled by Purely Events and the cakes were made by the very talented Jo Burton of Jo Burton Bakes. 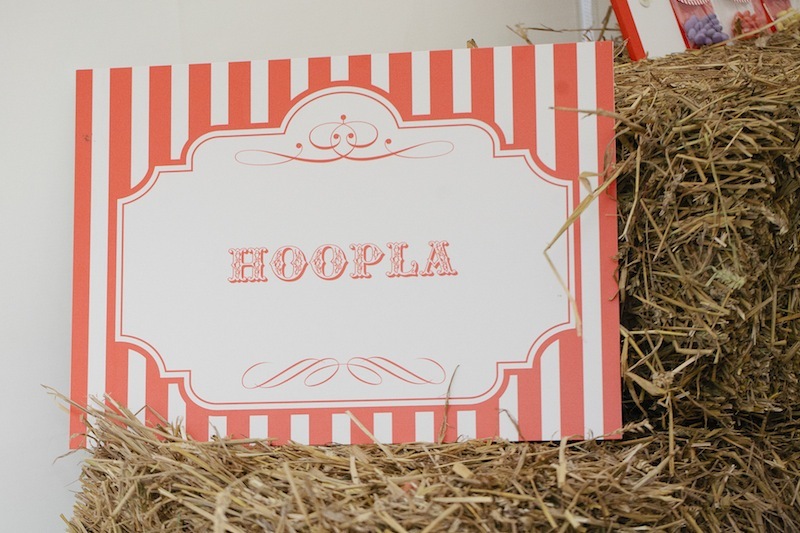 The children were so excited when they entered the circus area and found that they could play games such as Hoopla, Tin Can Alley and dress up in circus themed fancy dress. 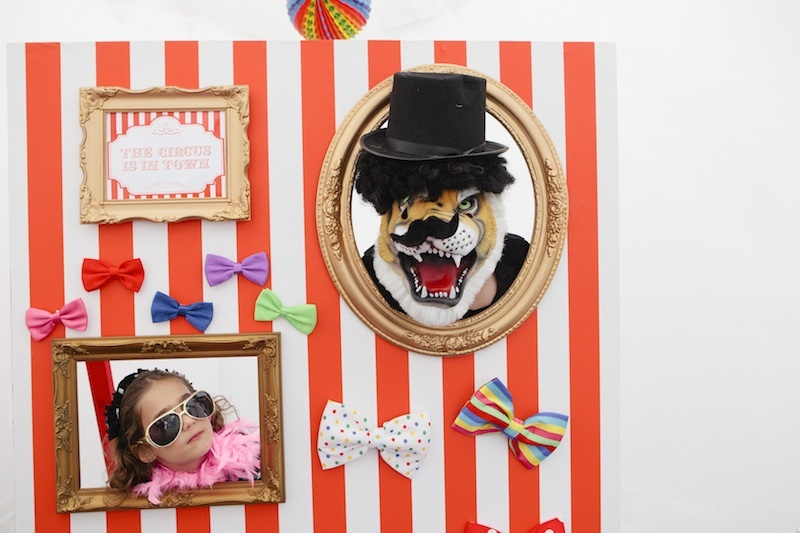 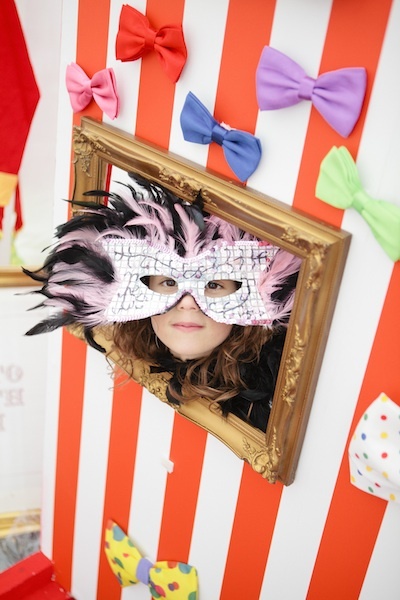 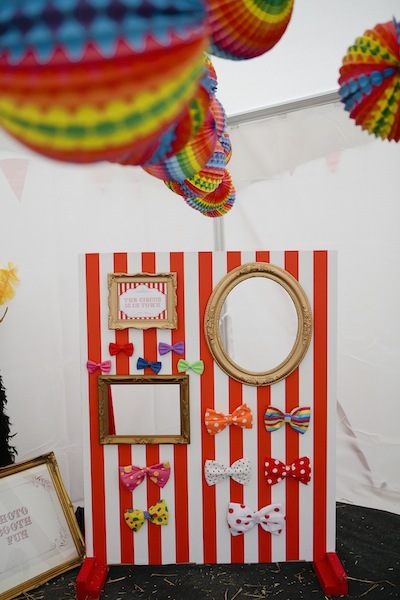 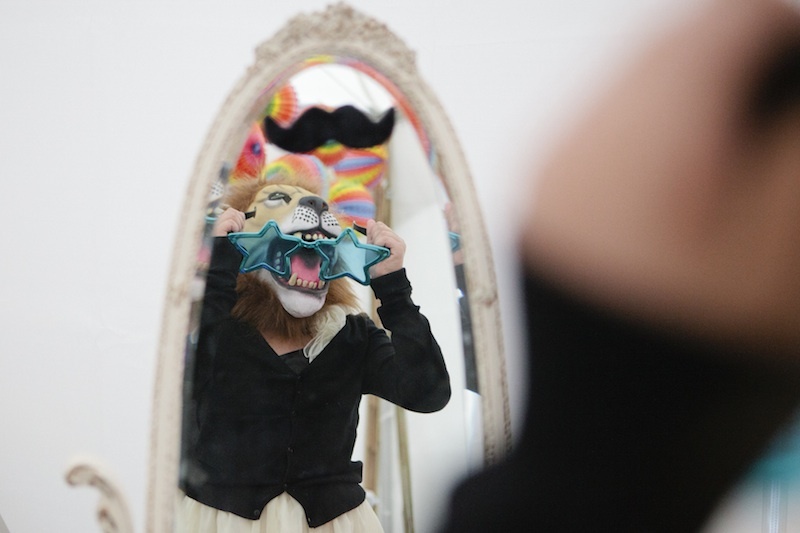 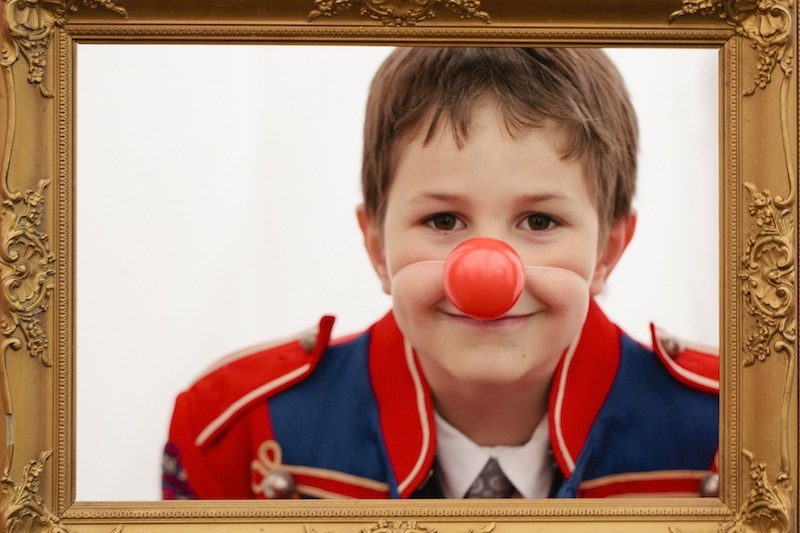 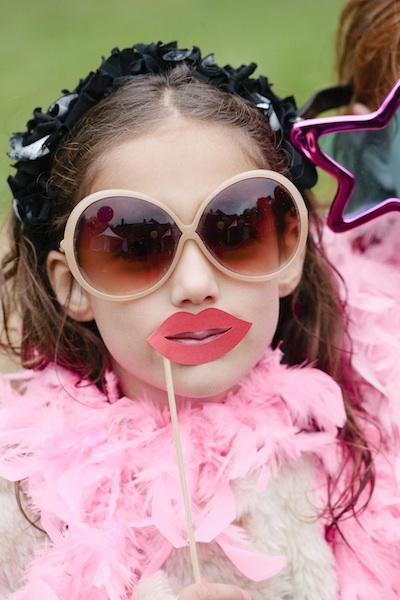 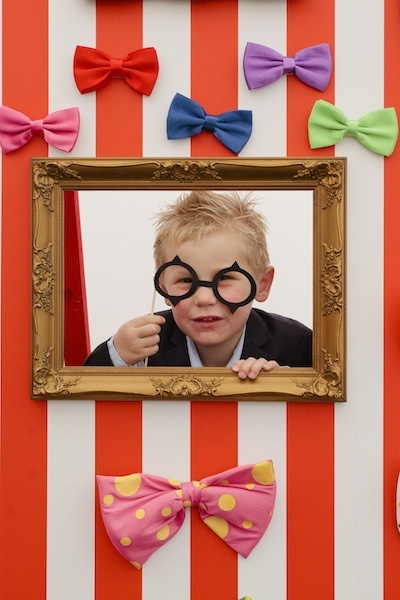 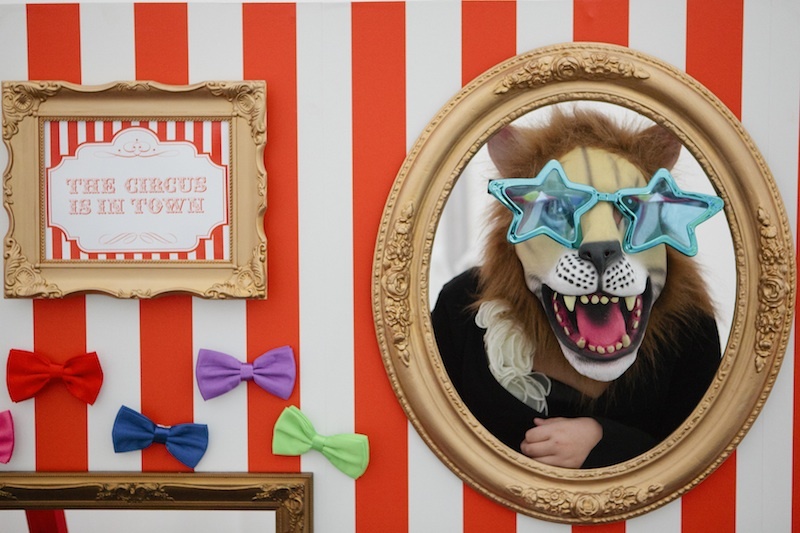 They really loved having their photo taken peeping through our specially created circus themed photo board. 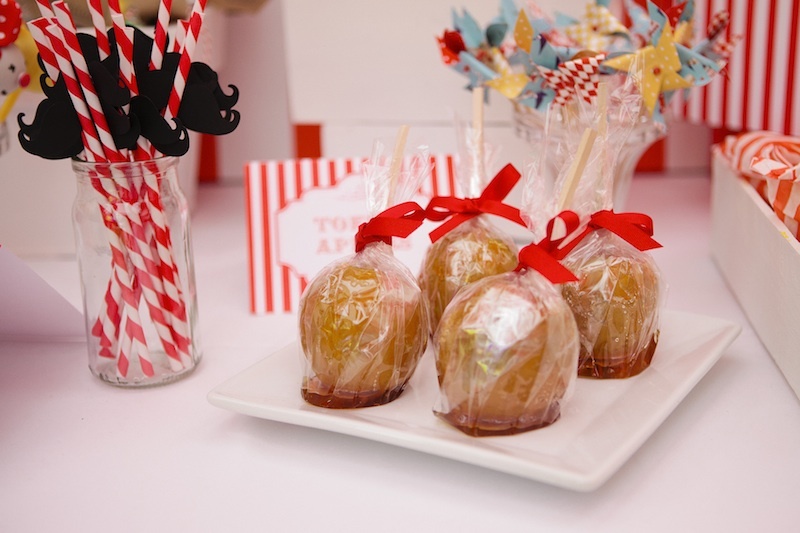 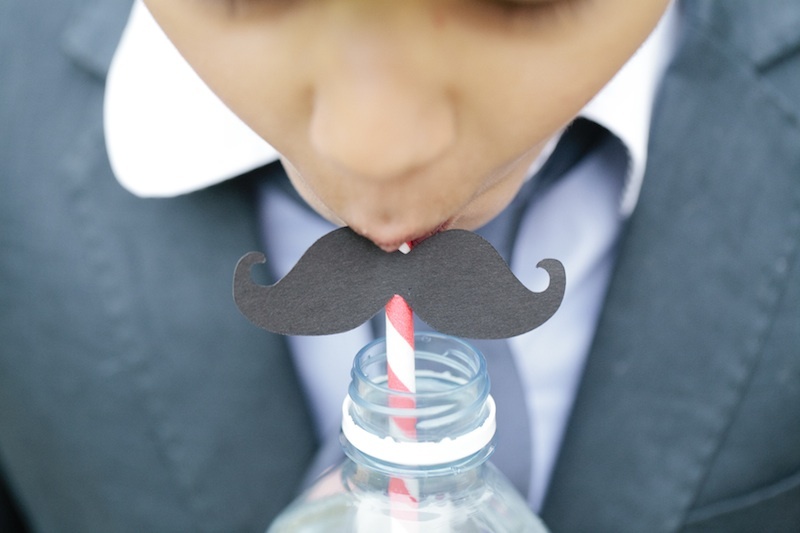 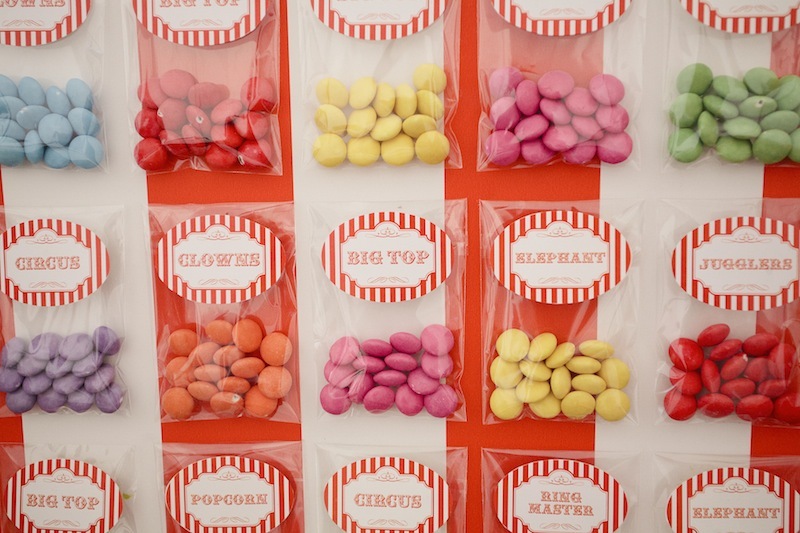 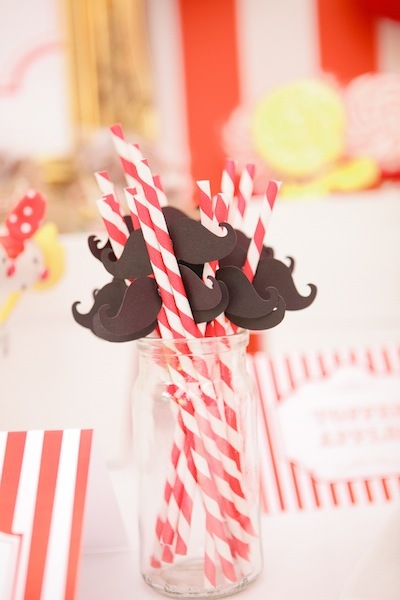 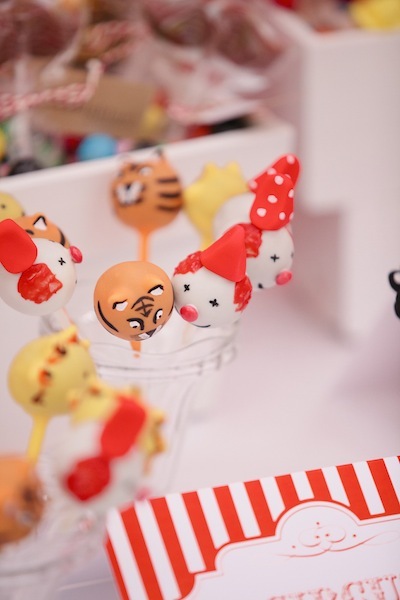 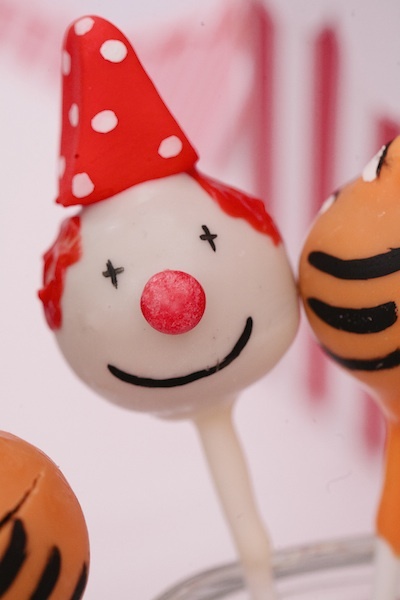 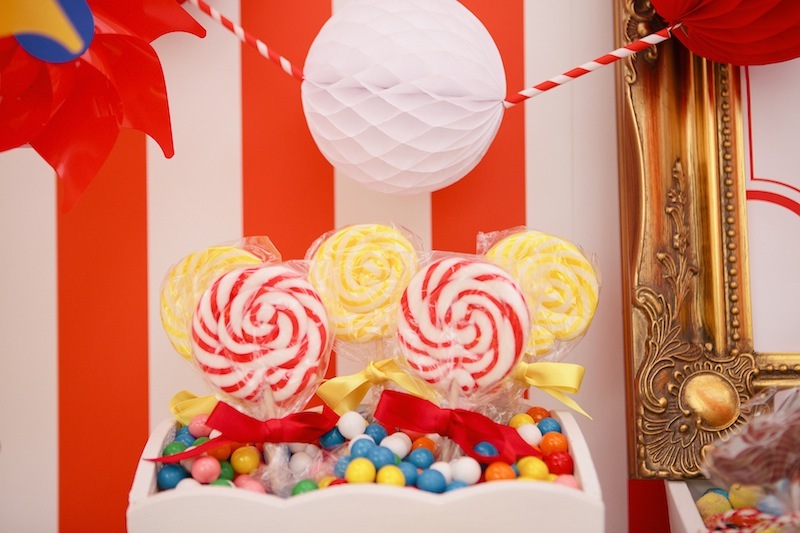 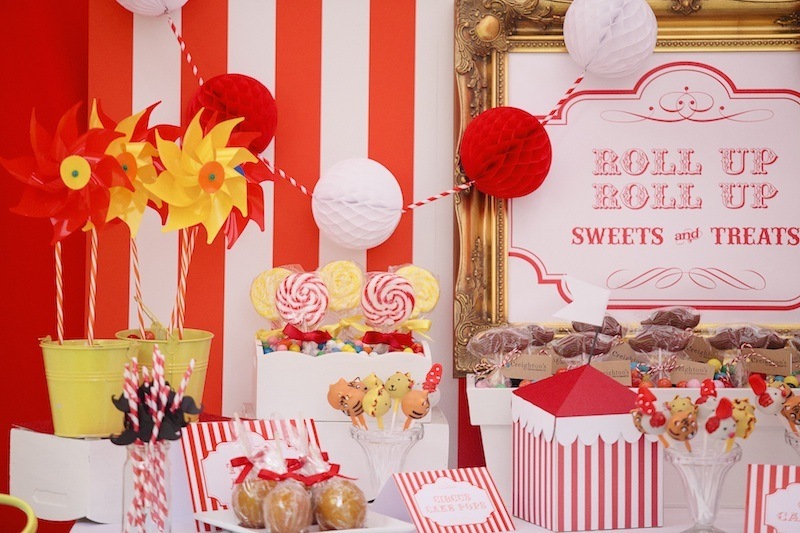 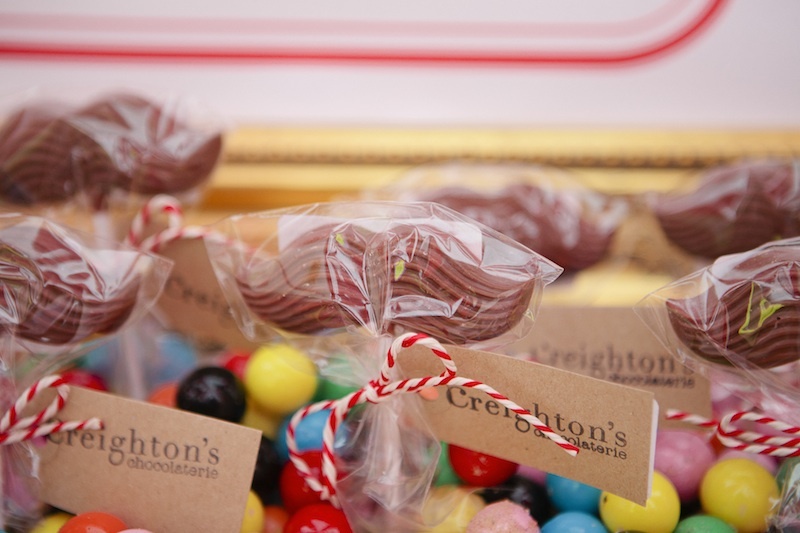 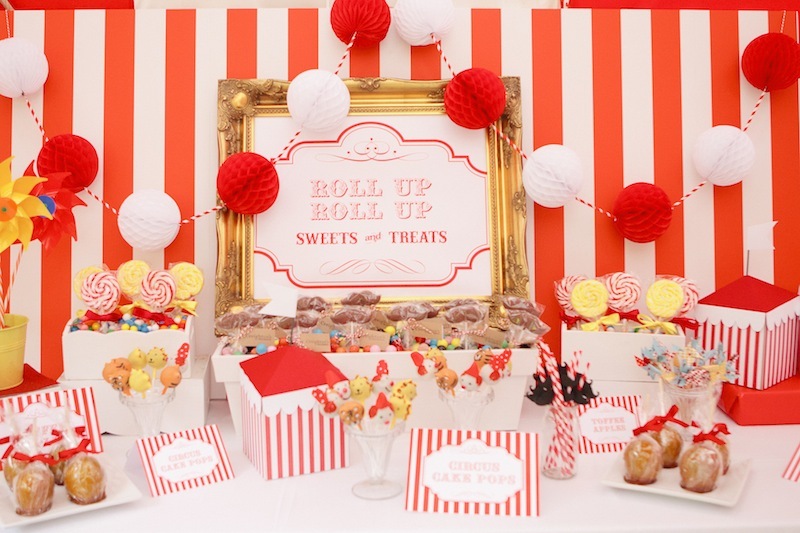 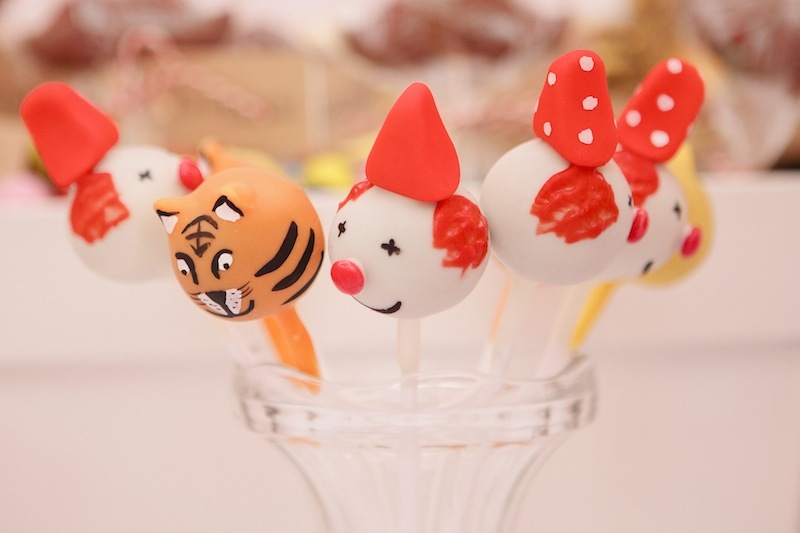 The children were also treated to their own food table complete with chocolate moustaches, popcorn freshly made from the popcorn cart, lollies, toffee apples and circus themed cake pops from the amazing The Cake Pop Company . 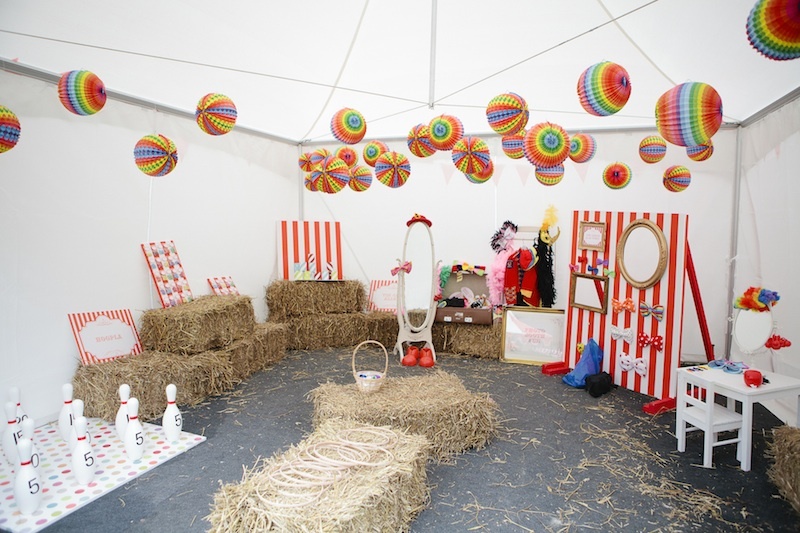 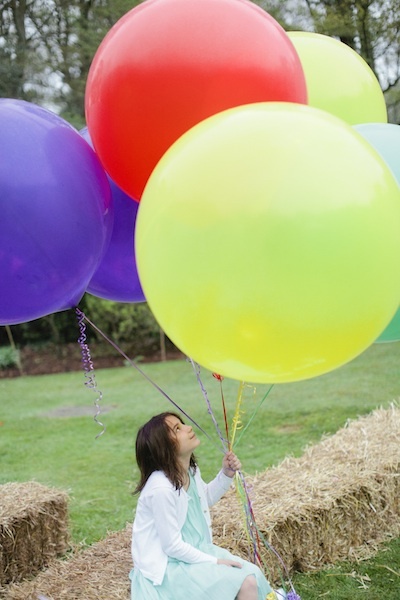 The whole area was designed by Purely Events we finished off the look with hay bales and 36’balloons which were inflated by Inge from the party shop in Godalming. 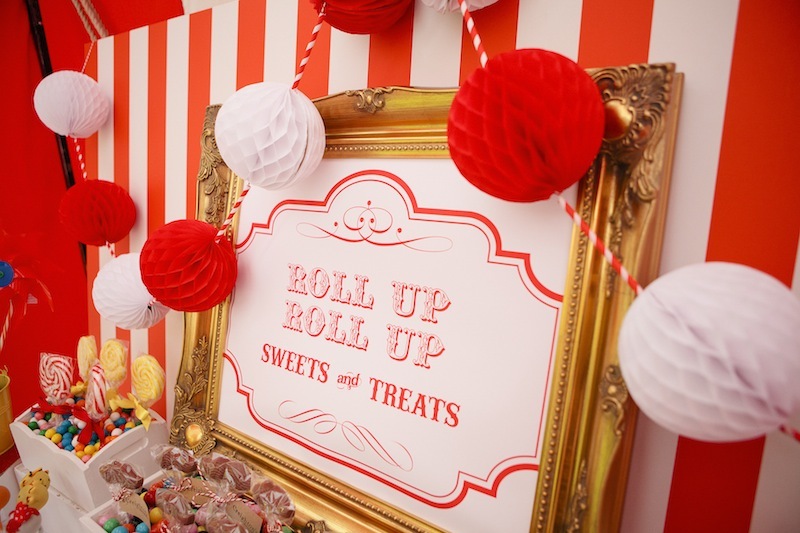 All of the wonderful signage was created by Michelle Fiedler . 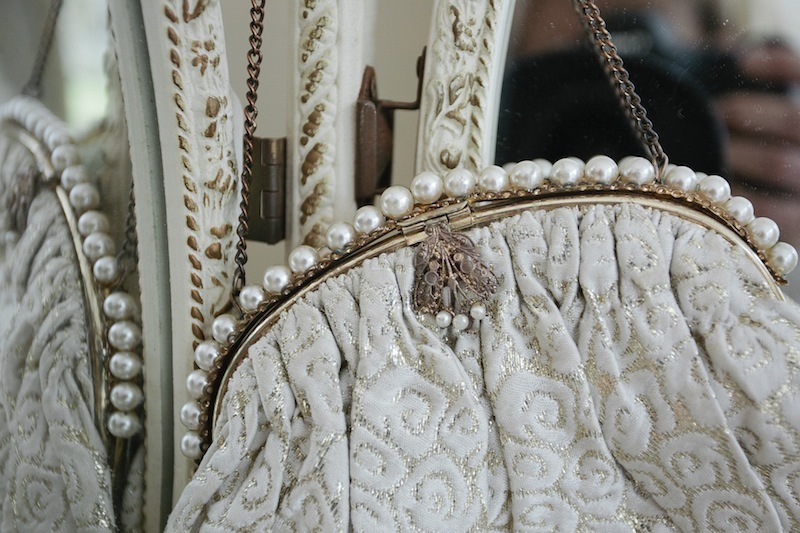 She did an amazing job and we really couldn’t have completed the look without her. 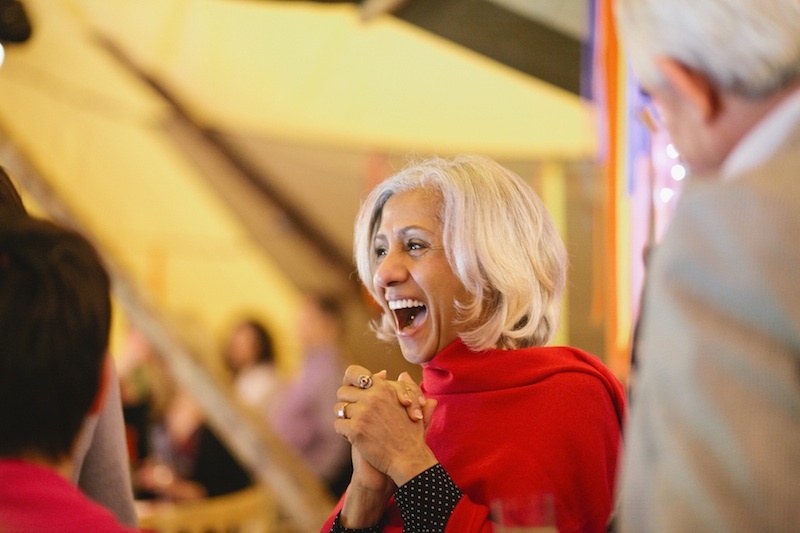 Deborah Mitchell printed all the signs and again is a huge support to Purely Events. 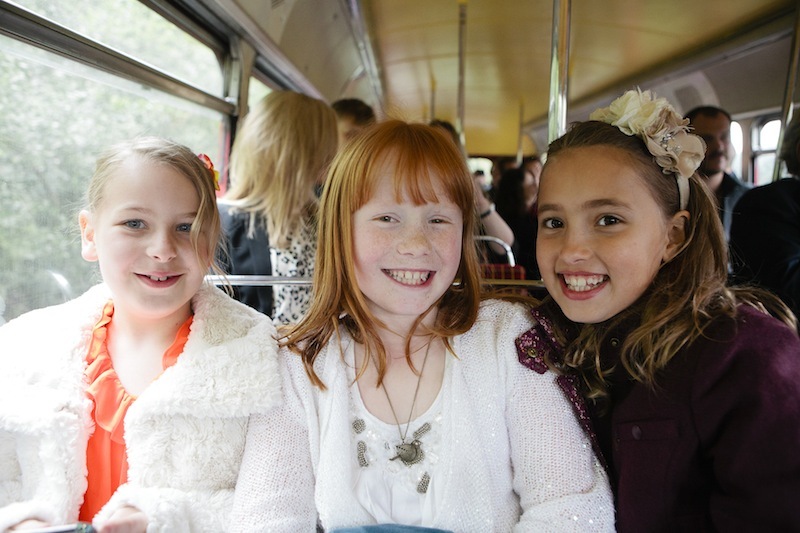 I can’t recommend these ladies enough. 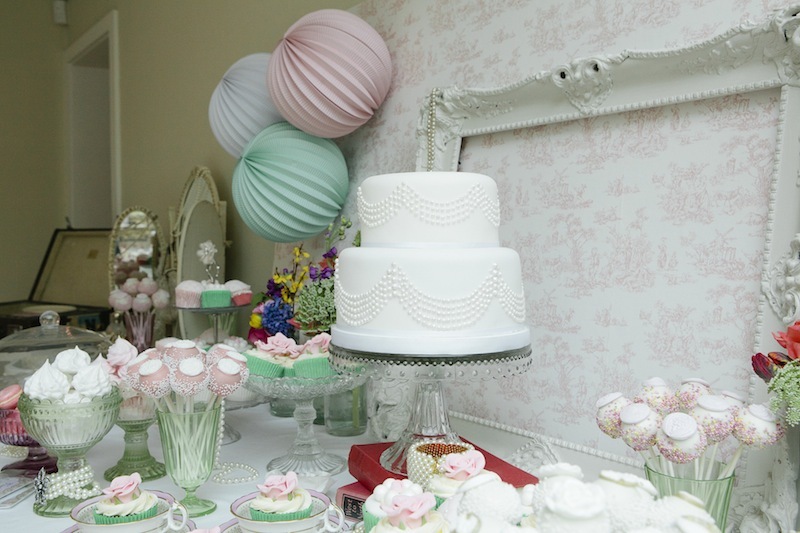 As well as the yummy sweets and treats table we also provided the little guests with a styled ice cream parlour table. 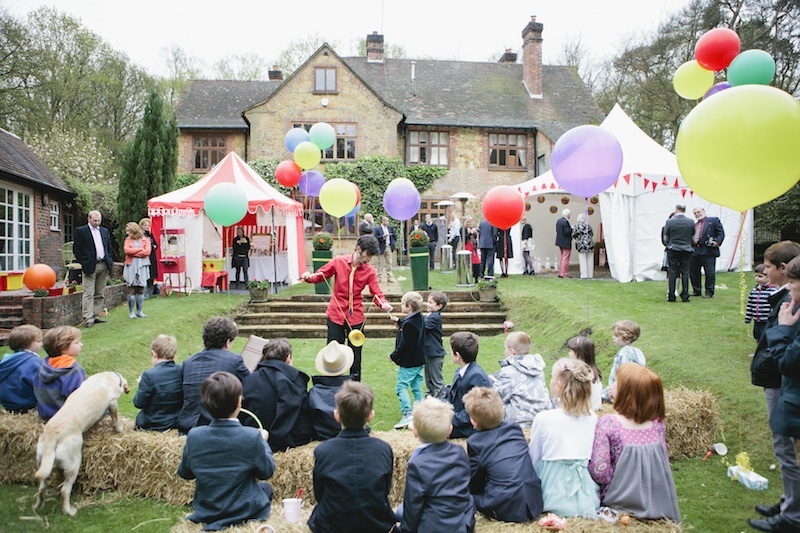 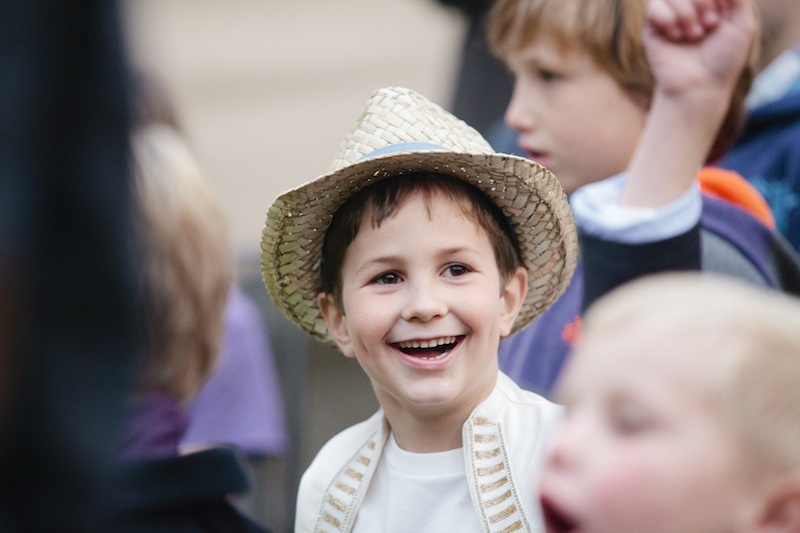 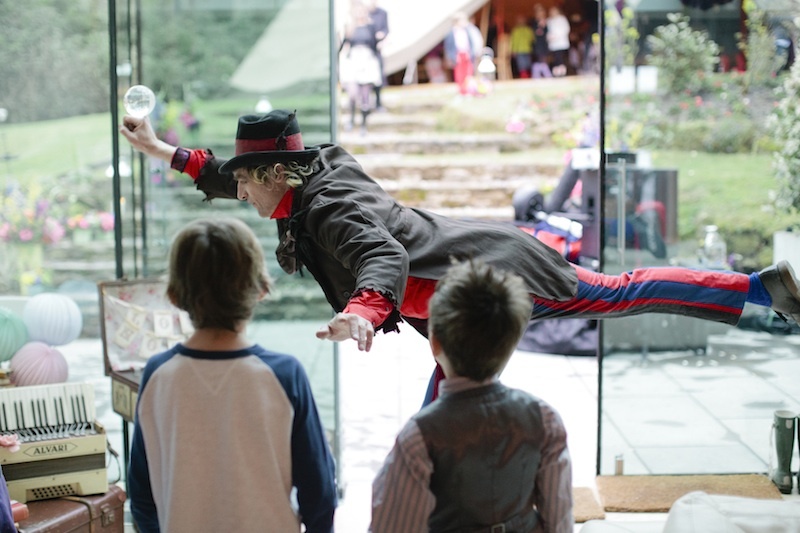 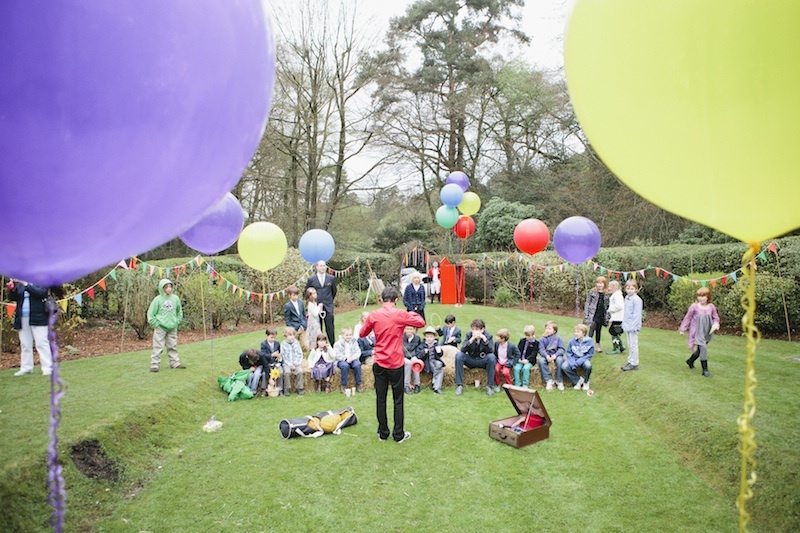 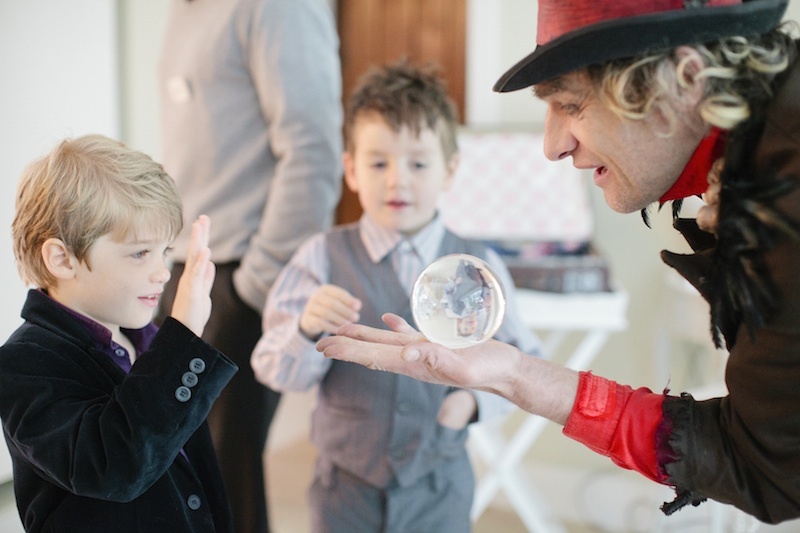 After all that playing and eating the children were entertained with a circus workshop run by the extremely talented juggler and circus performer Sam. 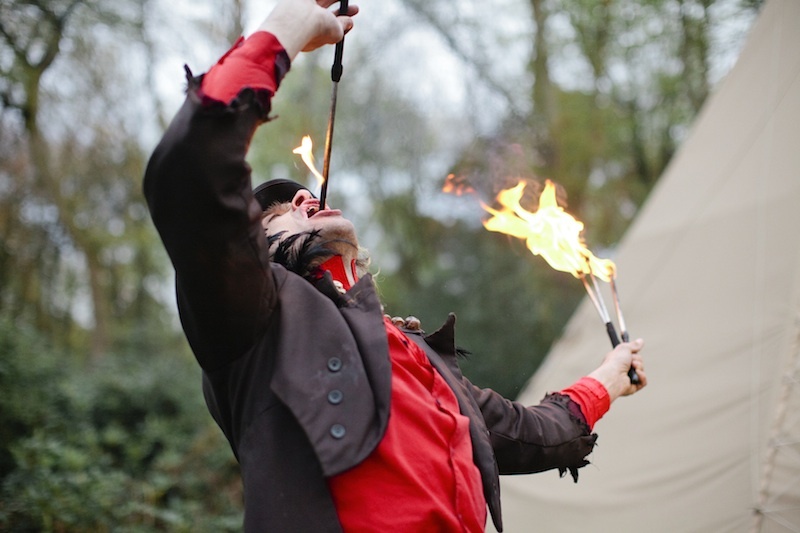 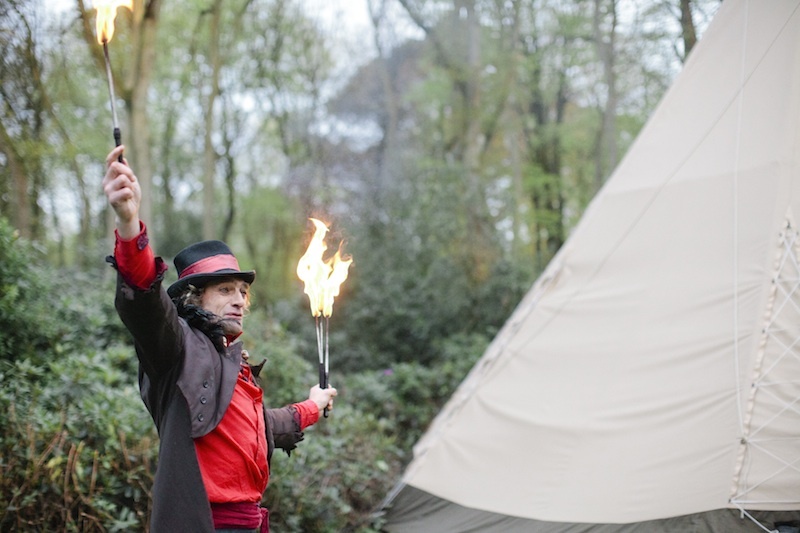 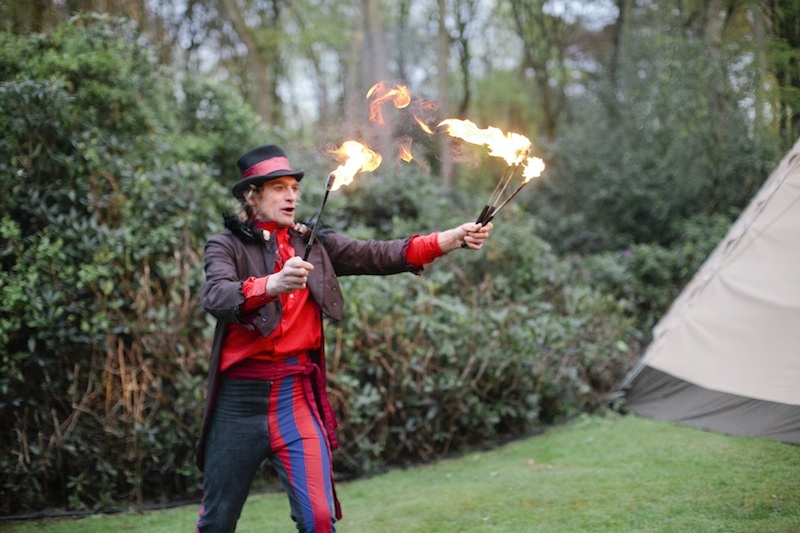 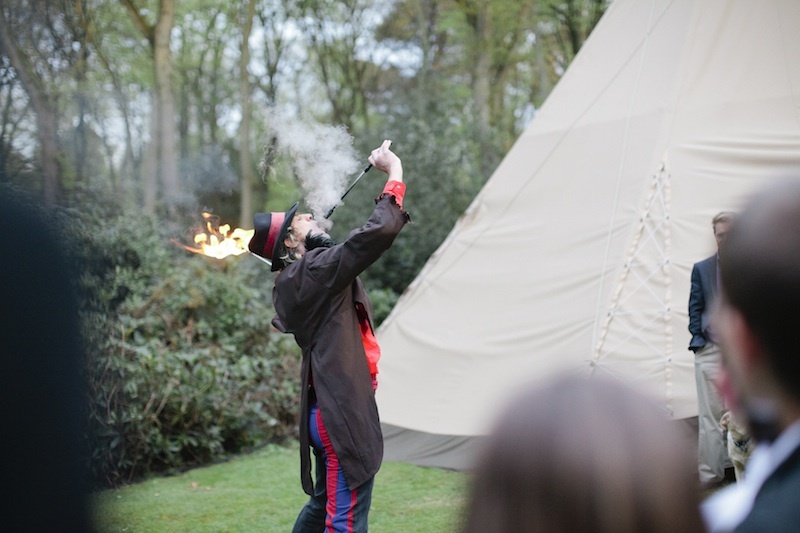 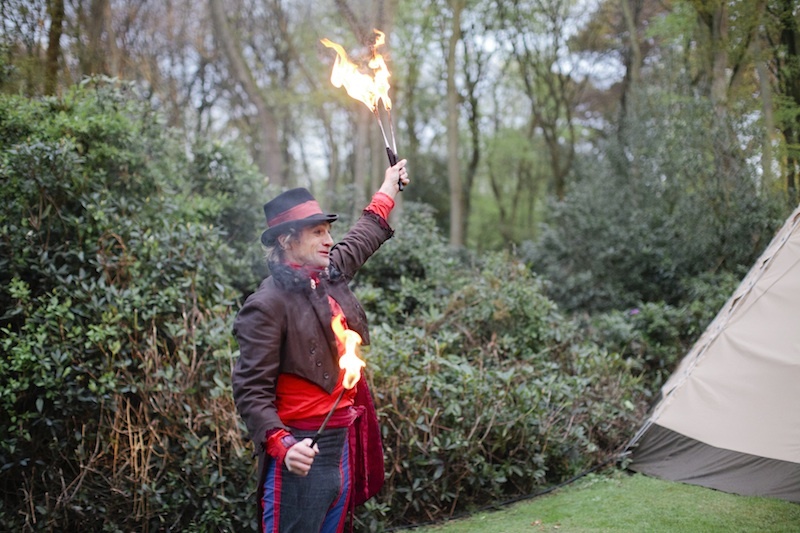 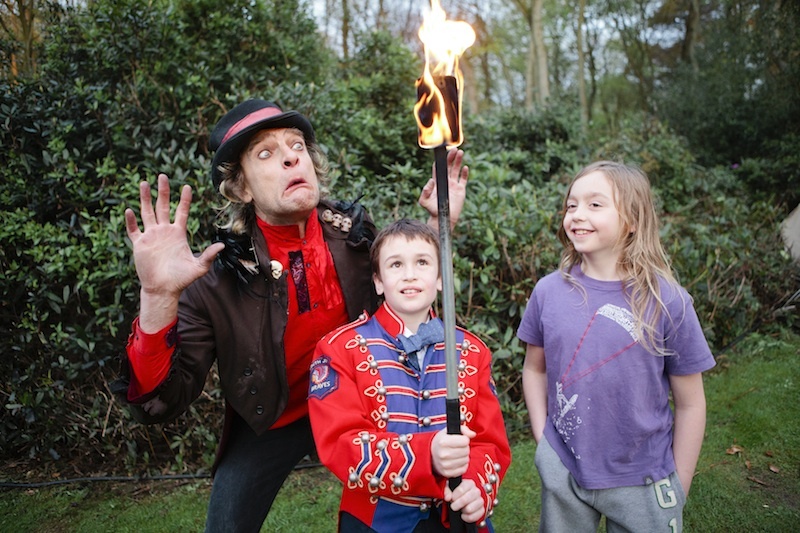 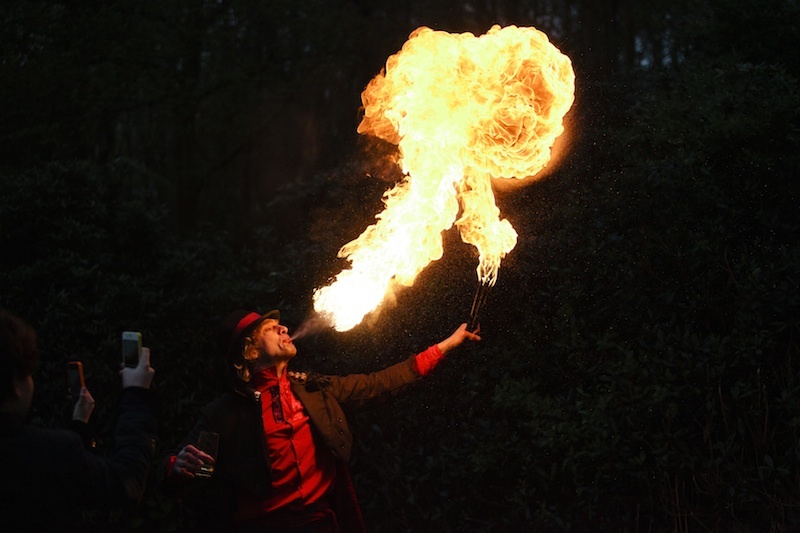 A short time later the adults and children were also entertained by the awe inspiring Big Grey who tantalised everyone with his fire eating and juggling act. 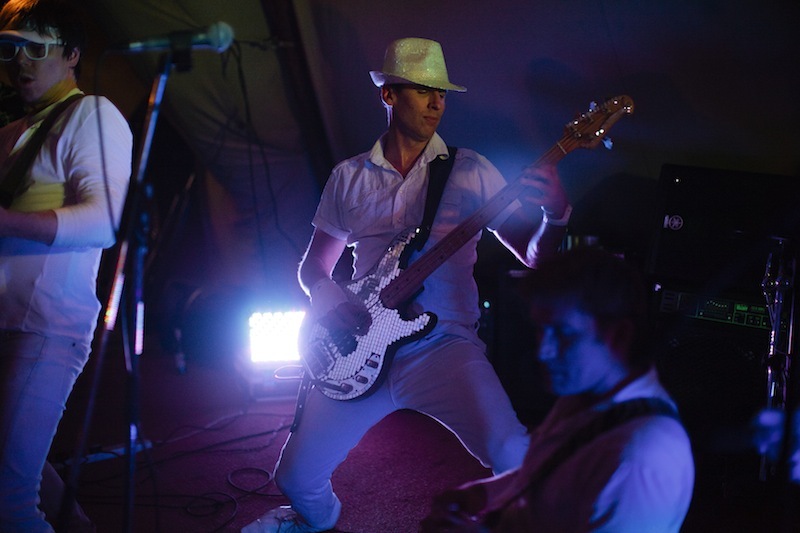 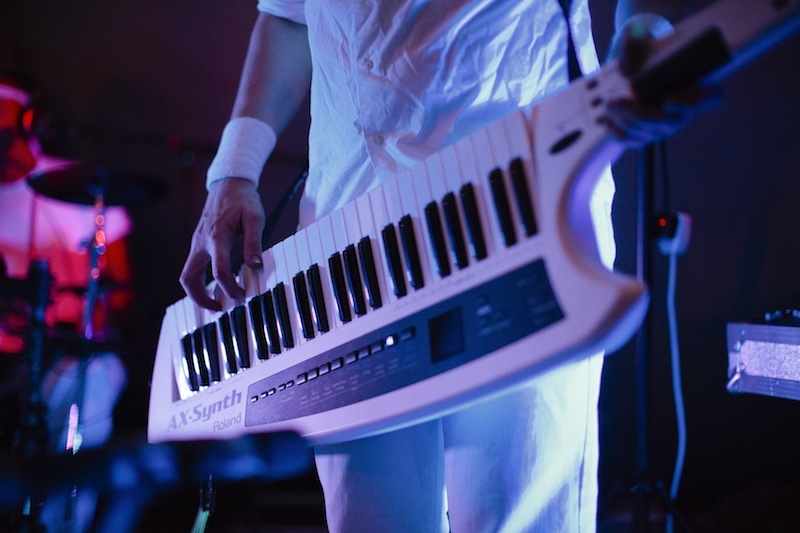 After all the fun and food the evening ended with one of the UK’s best cover bands taking the party right back to the 80s up to the current day with songs from Duran Duran, Wham, Queen and LMFAO. 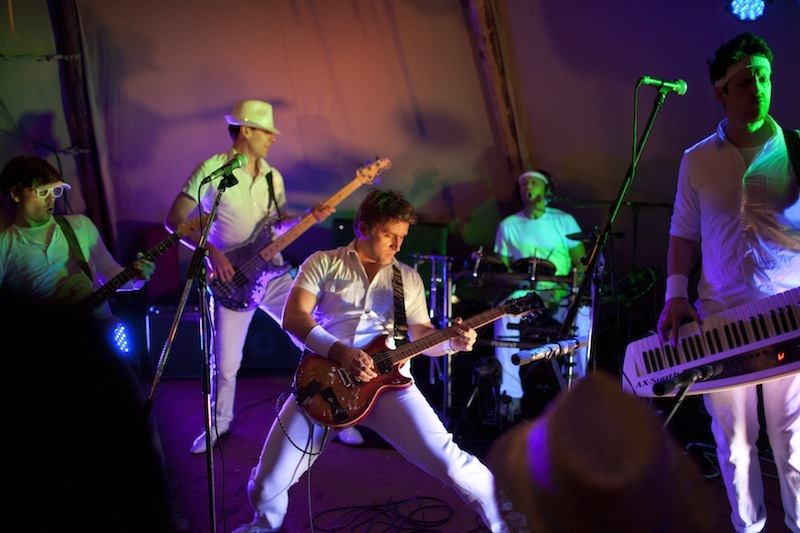 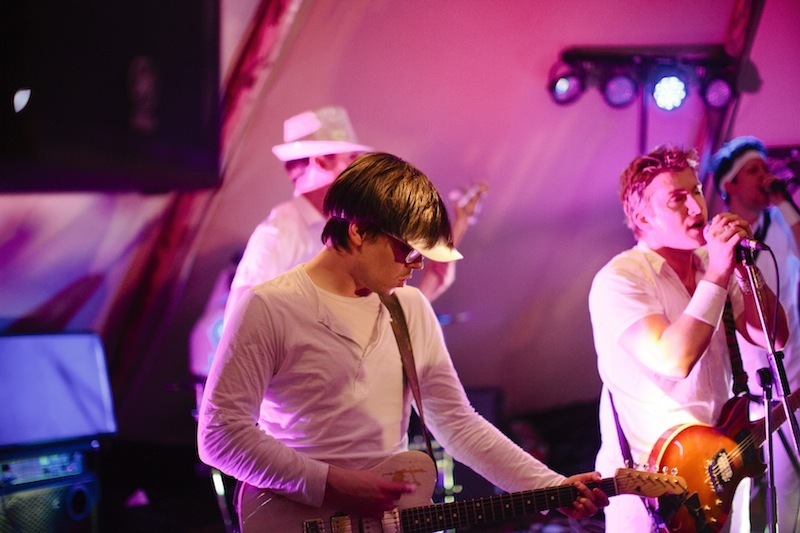 Their energy was unreal and they describe themselves as a guilty pleasure which they certainly are. 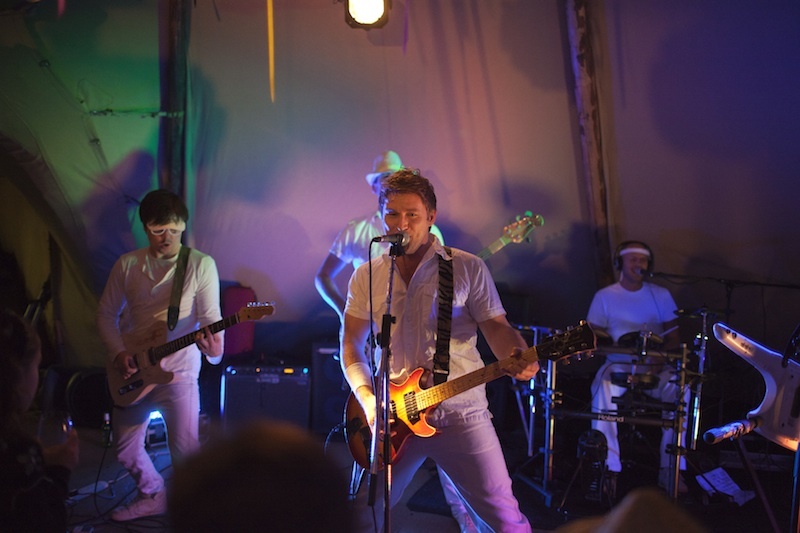 Cool funky they completely rocked the wedding. 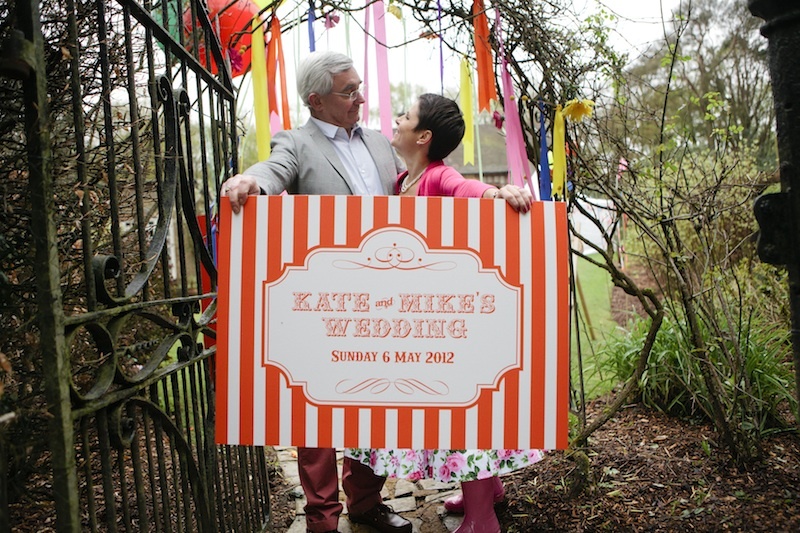 Congratulations Mike and Kate you were a pleasure to work with and we couldn’t ask for a more fabulous couple. 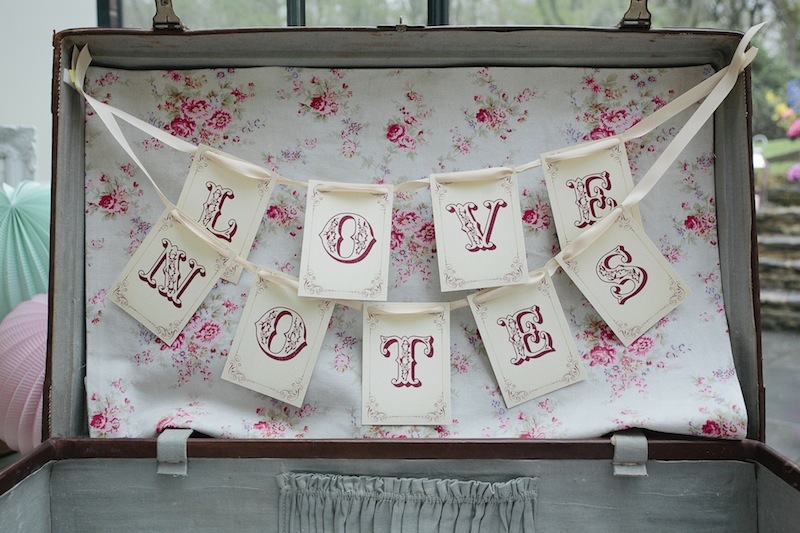 We wish you all the love in the world.